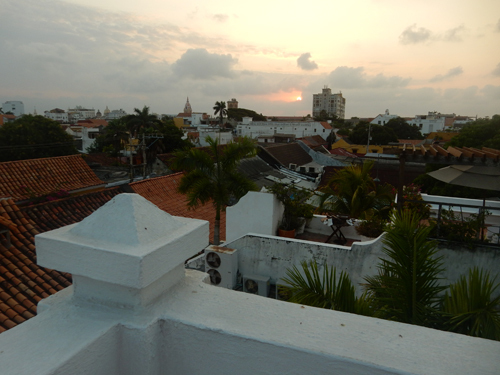 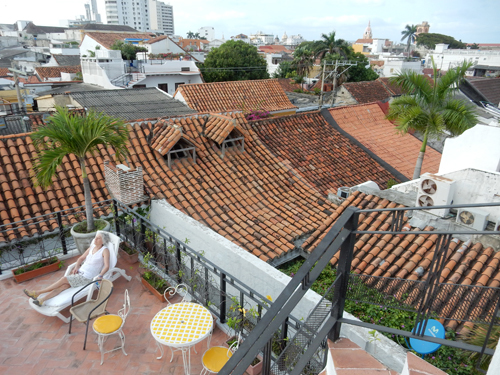 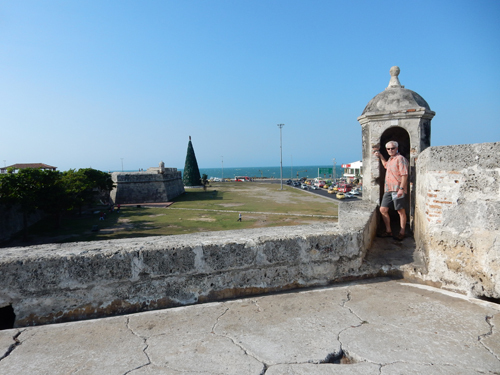 January 17 – Chad dropped us off at the Dayton airport at 4:45am and we landed in Cartagena Colombia at 2pm (no change in time zone). 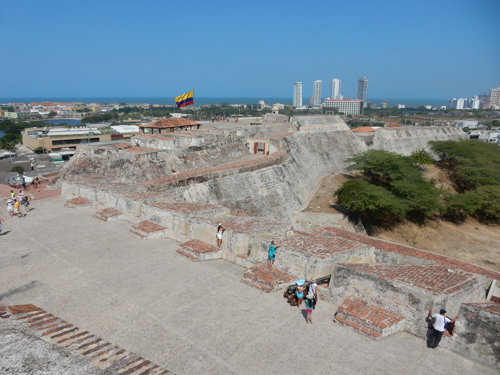 After checking into our guesthouse, we began to explore the old city by walking the northeast sections of the city wall. 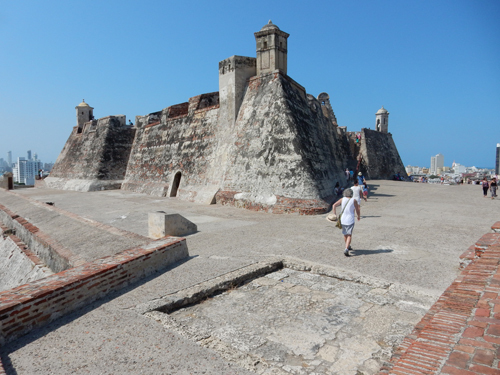 There are over 8 miles of city walls (Las Murallas) and we walked every inch during our stay! 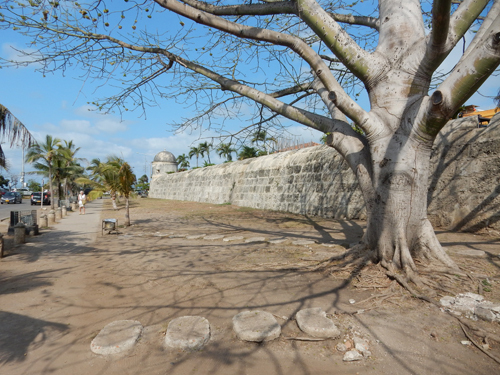 The construction of the city wall began during the 16th century, after a pirate attack by Sir Francis Drake, and was completed in 1796. 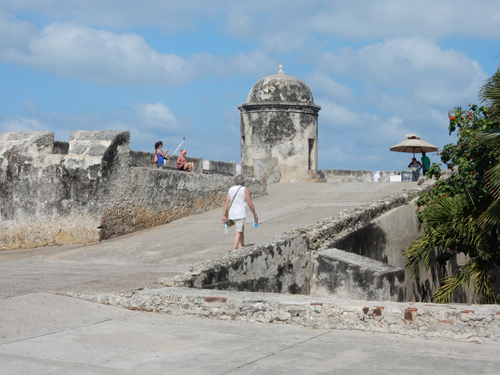 After walking our first section of wall, we started working our way through the maze of the old town. 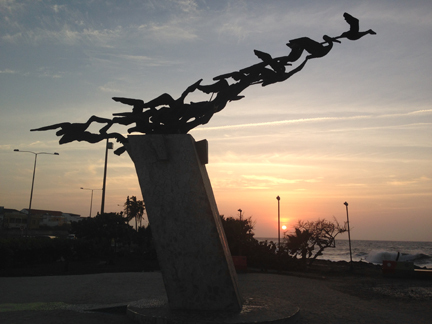 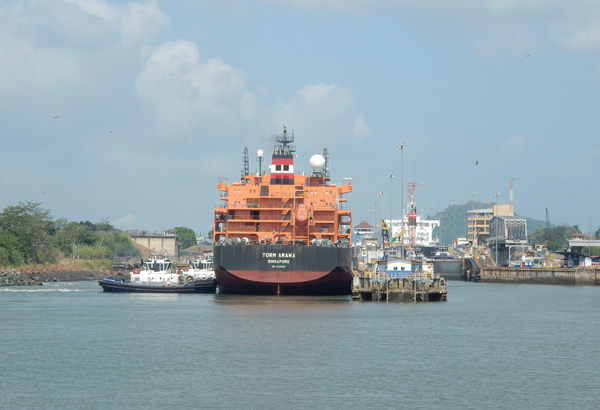 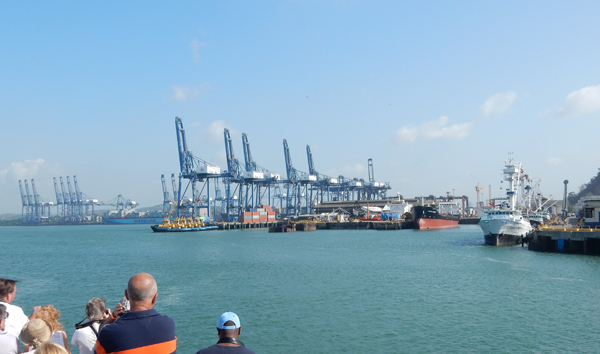 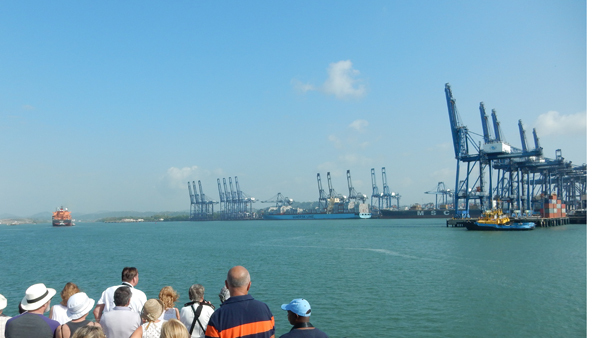 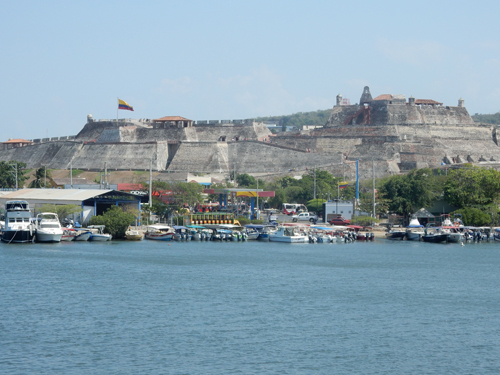 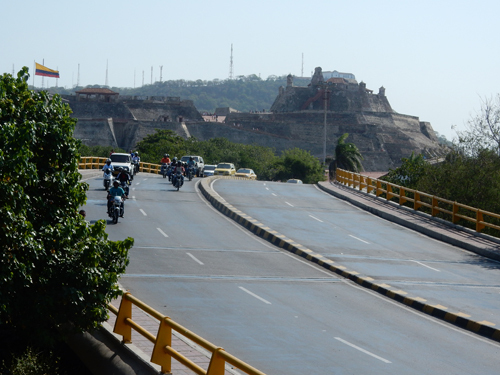 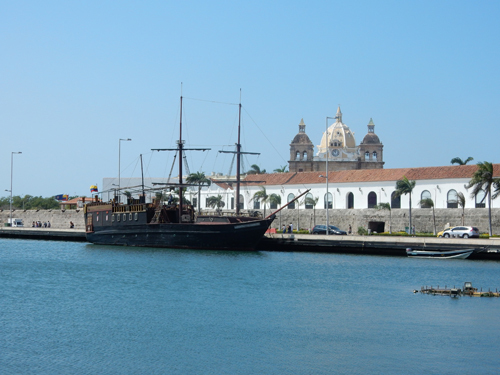 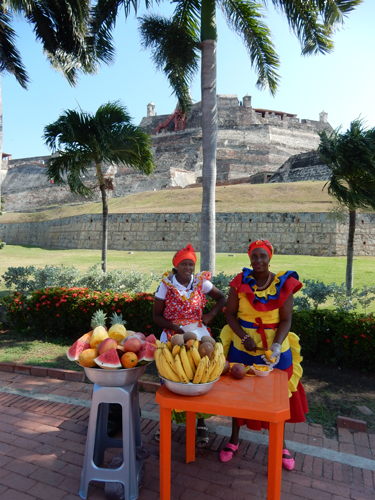 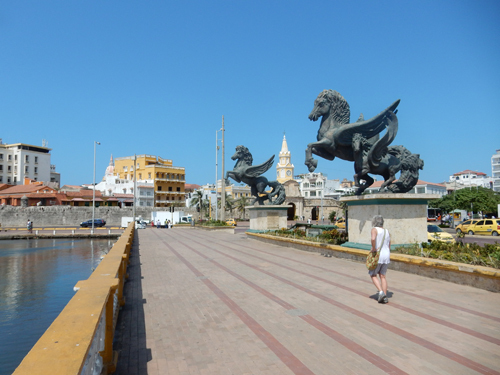 Cartagena was the main Spanish port on the Caribbean and the major northern gateway into South America. 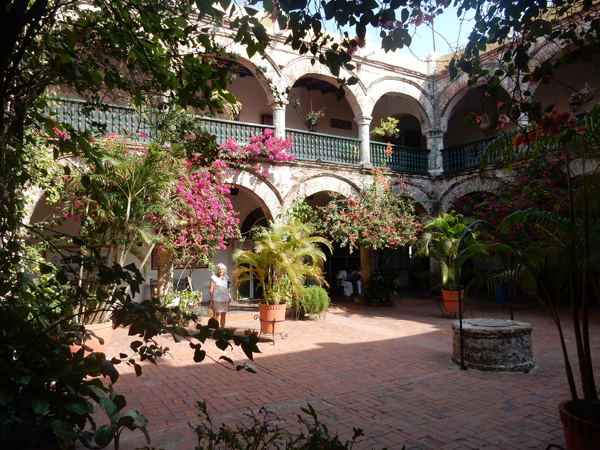 It is a UNESCO World Heritage Site with cobbled alleys, churches, plazas and balconies covered in flowers. 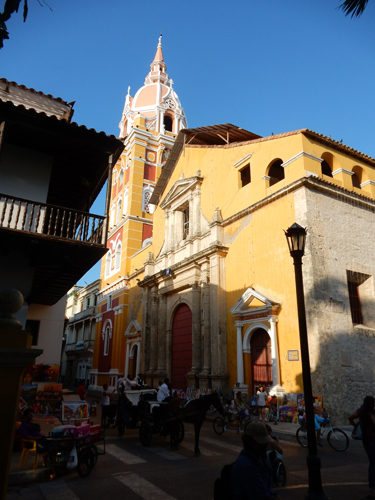 Cathedral of Cartagena was begun in 1575 and completed in 1612. 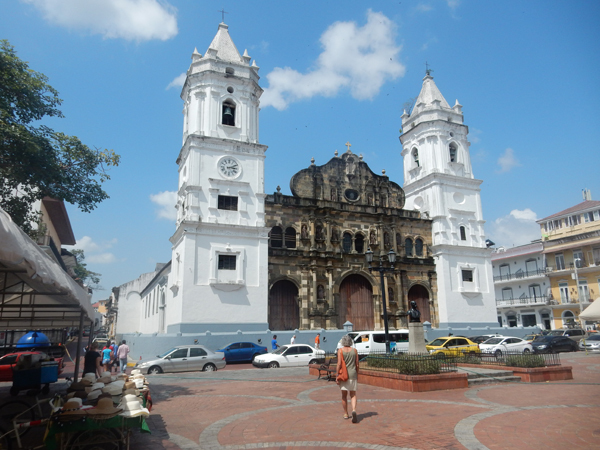 It is officially called the Metropolitan Cathedral Basilica of Saint Catherine of Alexandria and is one of the oldest episcopal sees in the Americas. 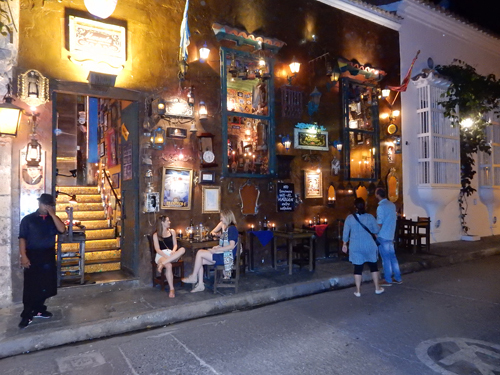 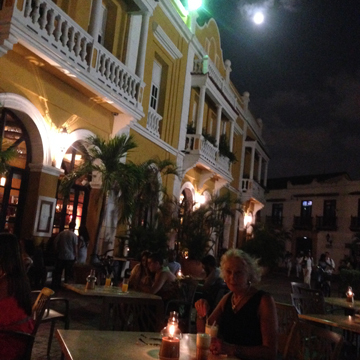 Interesting restaurant, we actually ate outside at another across the street – La Cevicheria. 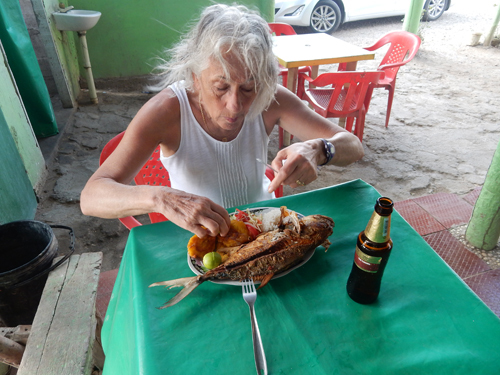 We knew it was a seafood restaurant and ordered Ceviche Douglas thinking it was a kind of seafood platter. 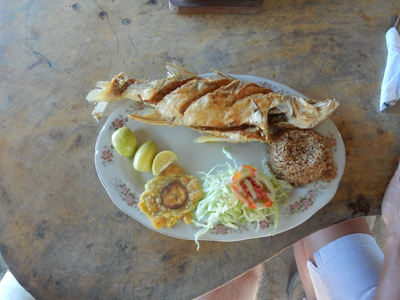 Well, it turns out Ceviche is raw seafood and what we each ordered was a VERY large bowl of raw (seasoned) shrimp! 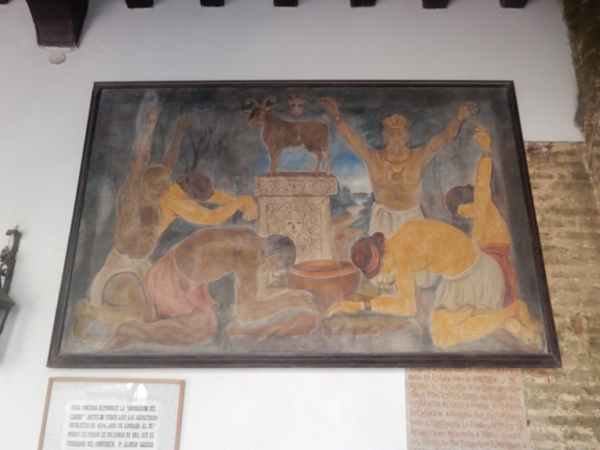 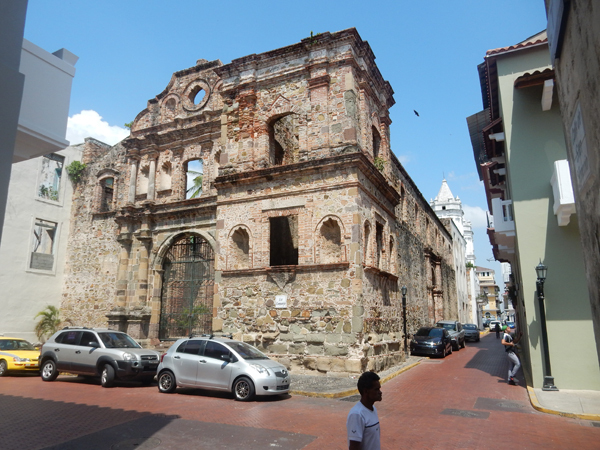 The Palacio de la Inquisicion preserves some of the gruesome details of the Inquisition in Colombia, which started here in 1610. 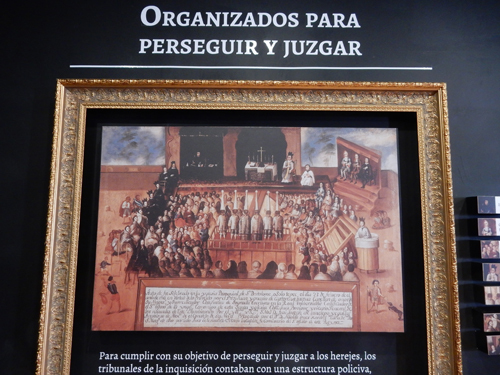 The crimes were magic, witchcraft and blasphemy and resulted in public executions. 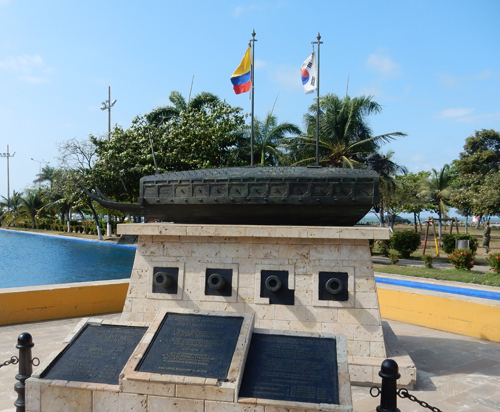 About 800 met with horrific deaths before the trials were ended in 1821 with Colombian Independence. 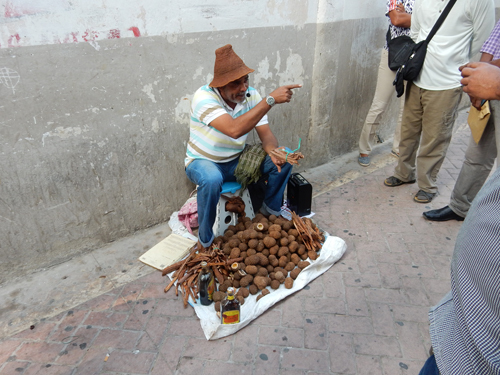 This is Juan, our English guide. 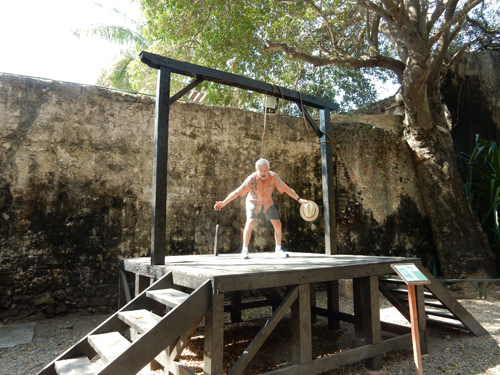 One of the outside displays – the gallows! 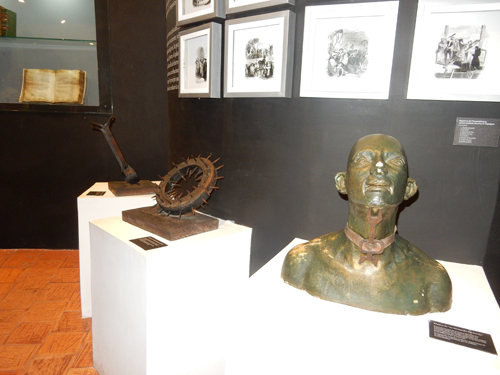 “Tools” of the trade – to force confessions! 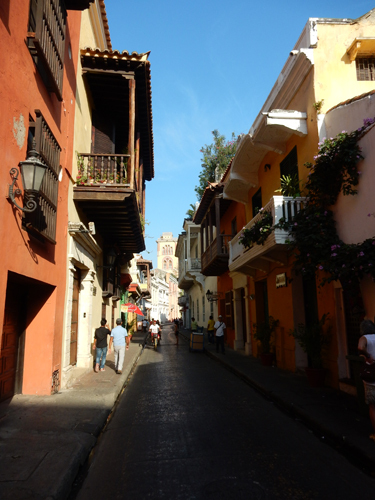 Yesterday we got disoriented several times as we walked through the maze of the old town. 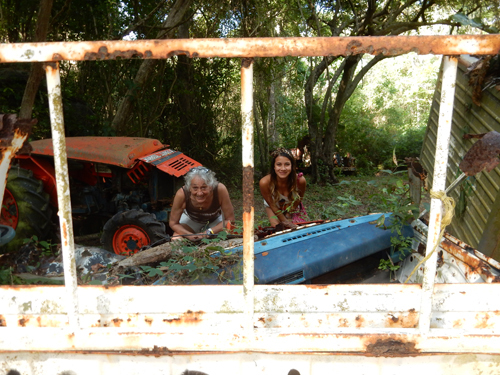 Today, we were like old pros! 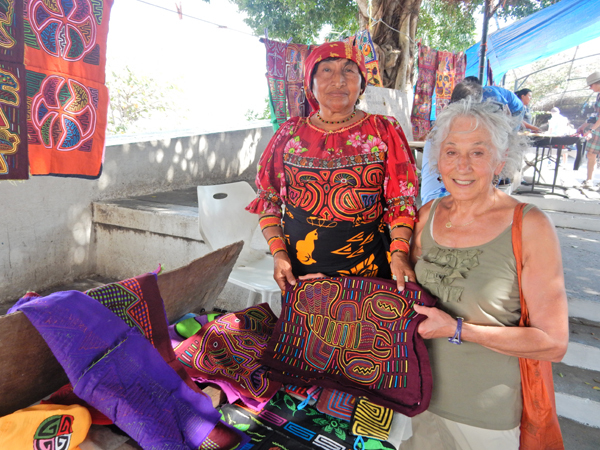 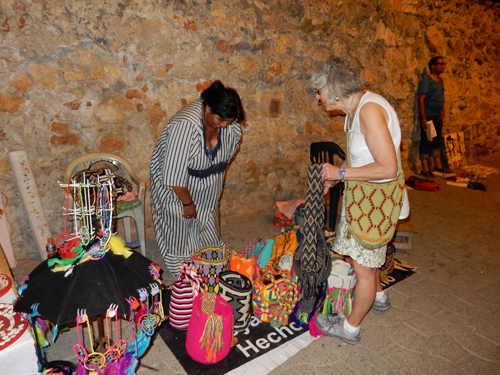 Should have bought one or more bags – I can’t believe I just wrote that; no wonder Helen enjoyed this trip so much! 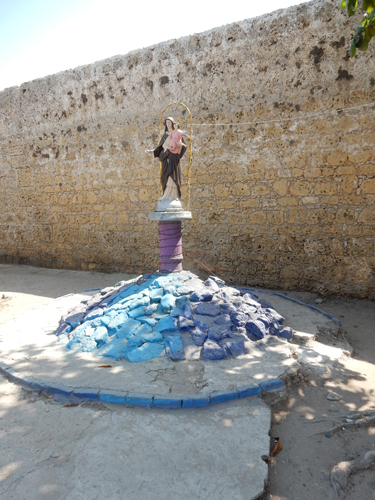 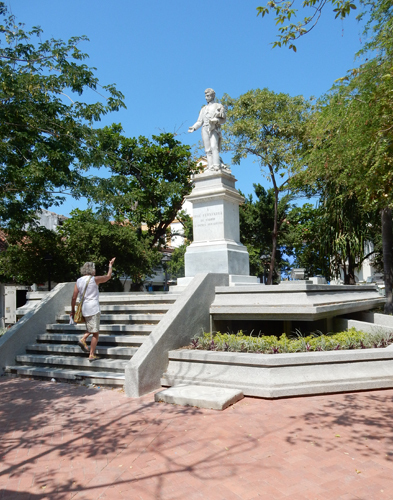 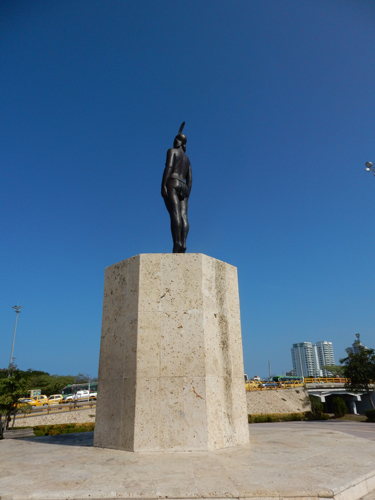 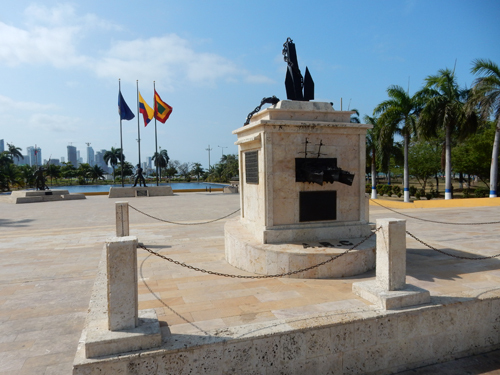 January 19 – Monumento a la India Catalina; statue of Catalina, a Carib woman who served as interpreter to Pedro de Heredia when the Spaniards first arrived. 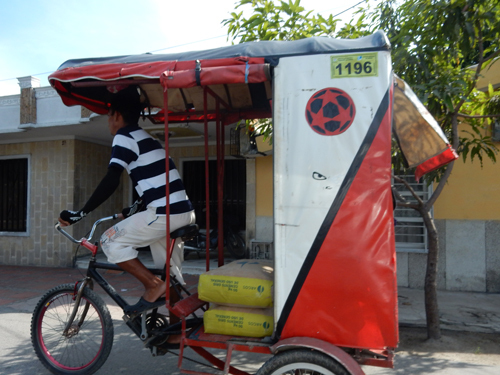 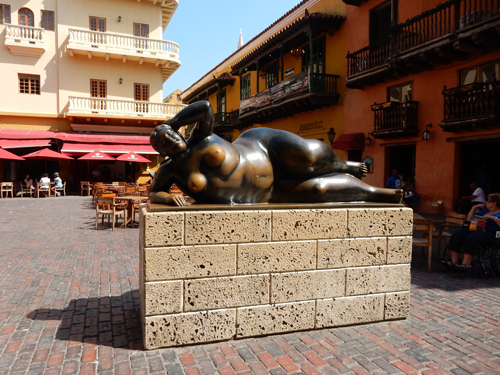 It is located outside the main entrance to the old city. 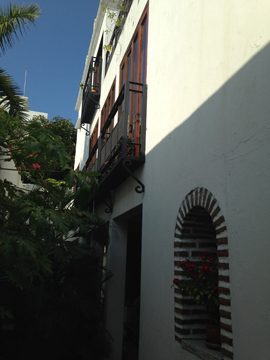 I meant to take a front view picture in early evening but never got around to it. 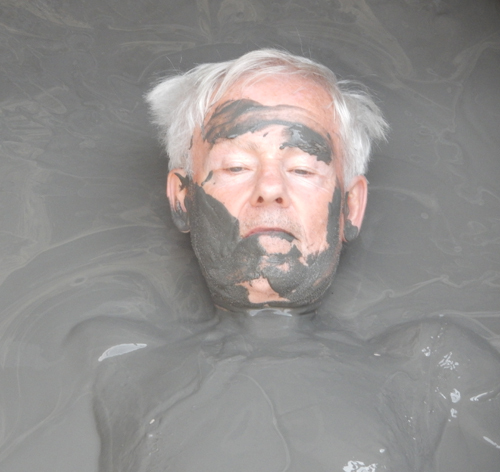 When I first saw this picture, I wasn’t sure who this was! 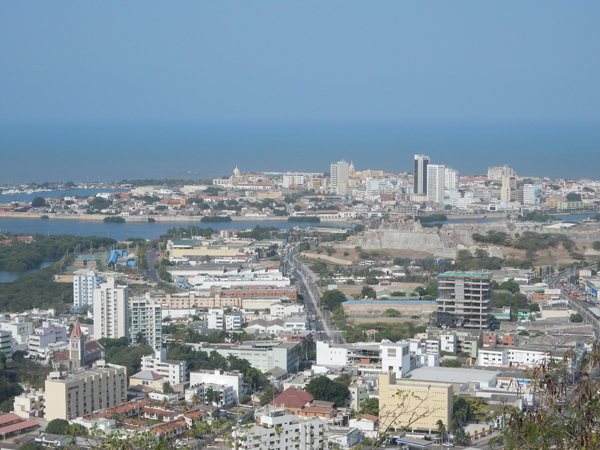 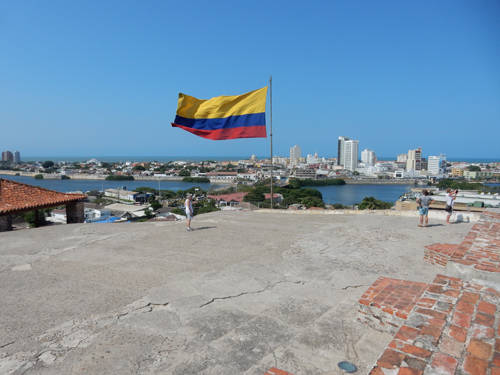 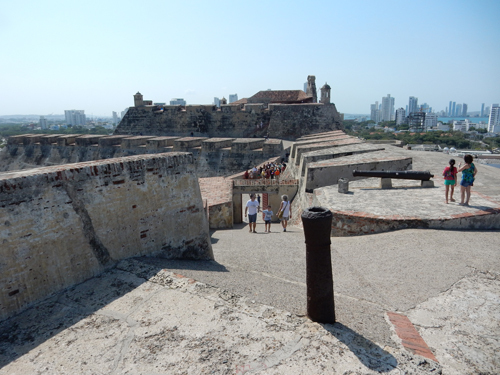 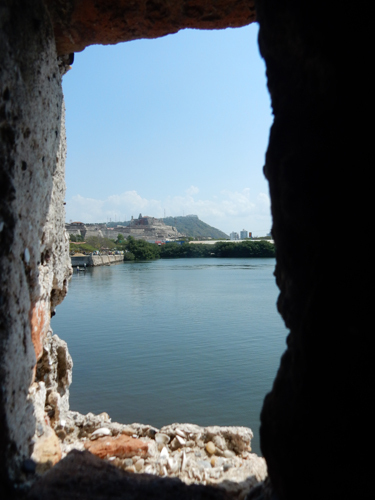 The fort was begun in 1657 and by 1762 it covered the entire San Lazaro hill. 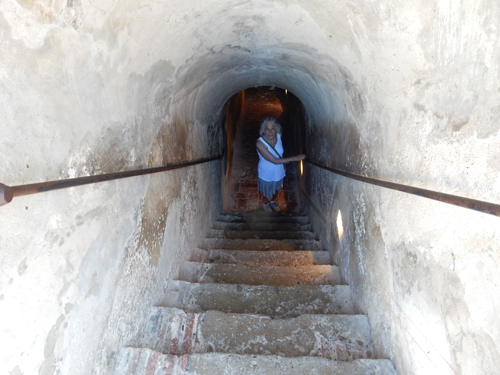 It was Spain’s greatest fortress and was never taken despite numerous attempts. 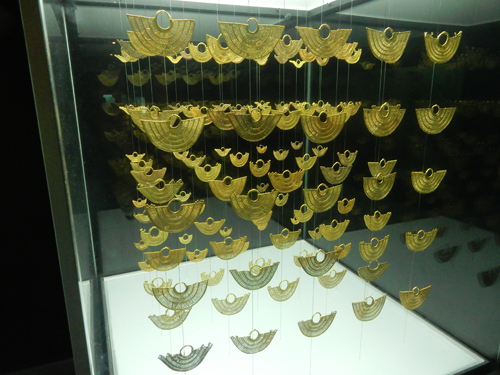 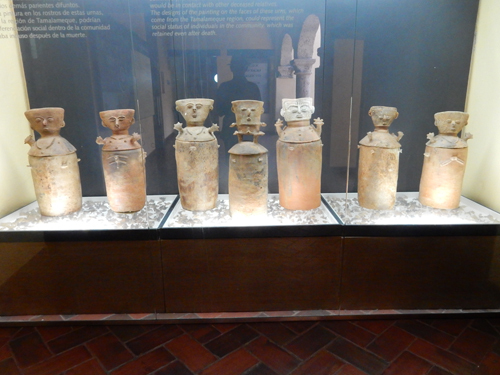 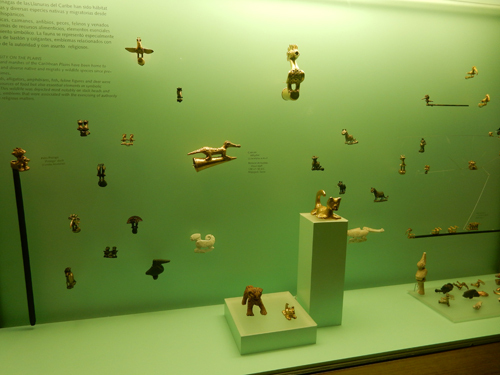 Small but very interesting collections of gold and pottery of the Zenu people who inhabited the region before the Spaniards – and it was air conditioned! 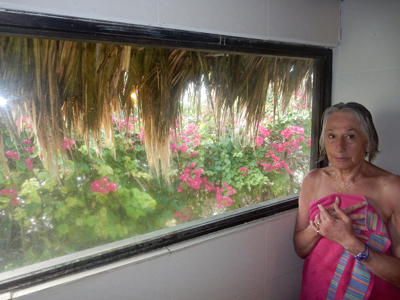 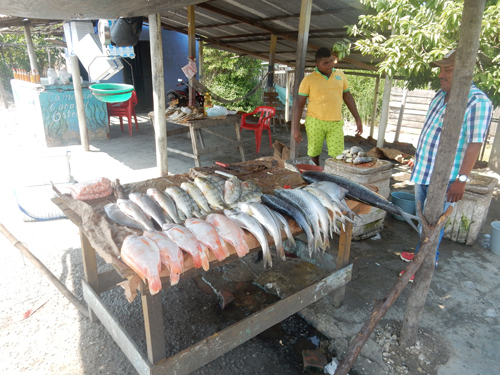 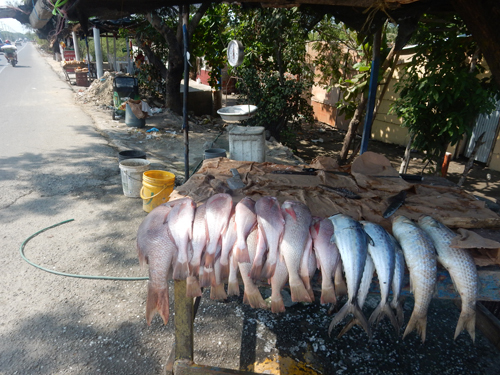 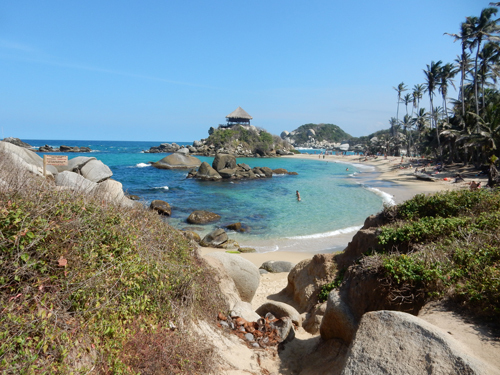 January 20 – Took a taxi to the airport to pick up our rental car and drove to our accommodations just east of Parque National Natural Tayrona on Colombia’s Caribbean north coast. 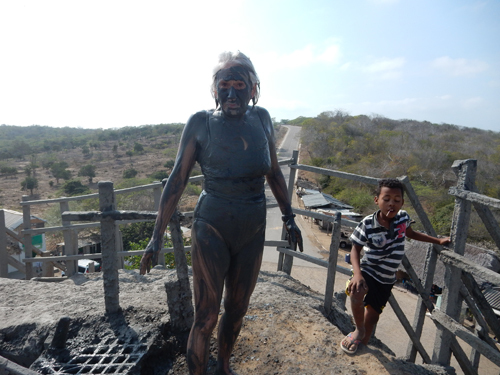 It took us 7 hrs (2.5 extra hours) due to car rental delays, construction and Google Maps problems getting through Barranquilla. 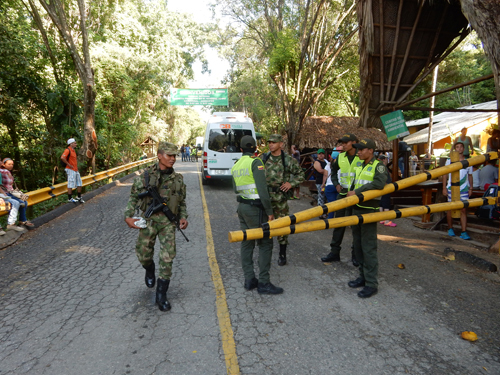 The route we traveled is one of the few in Colombia that the US State Department states is relatively safe to travel during the day. 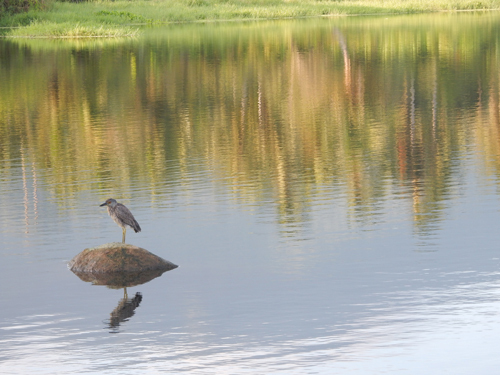 Here are a few roadside sites that we experienced along the way. 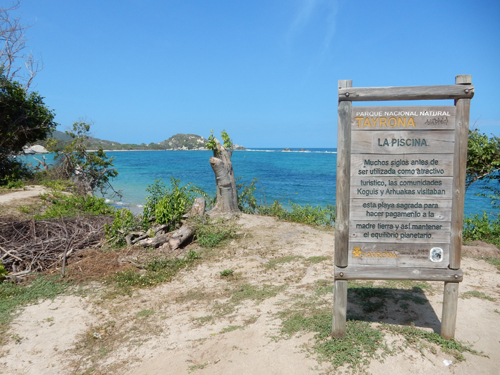 Entering Finca Barlovento property, which is located at Playa (beach) Los Naranjos where the Rio (river) Piedras enters the Caribbean. 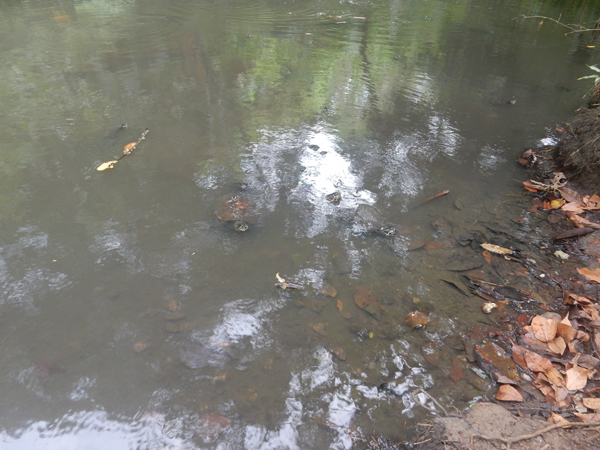 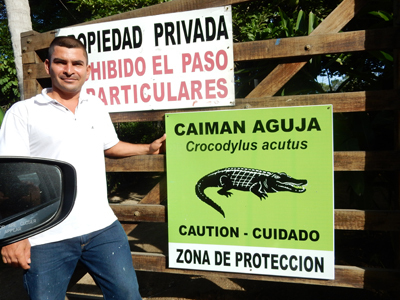 Caiman are crocodiles that inhabit the river here. 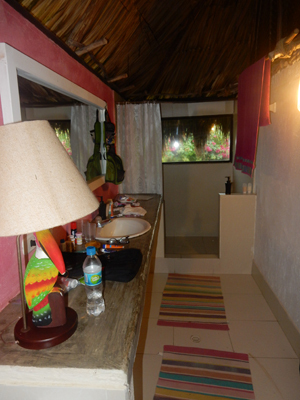 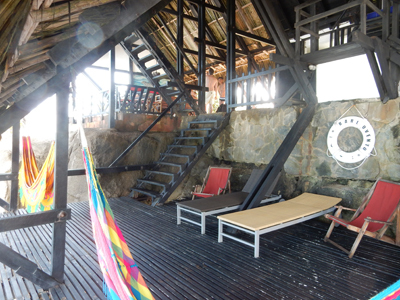 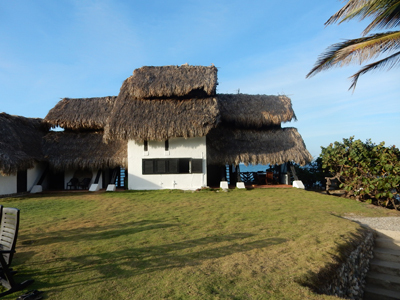 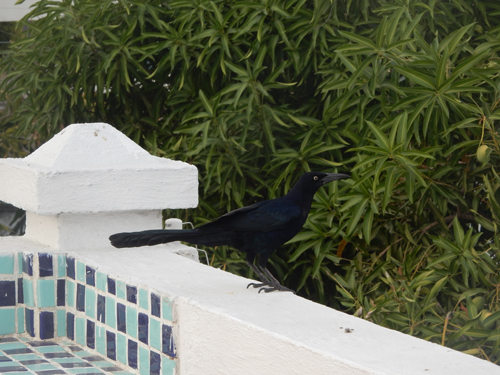 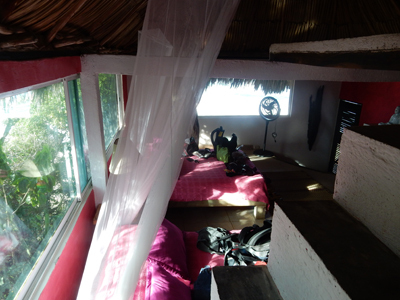 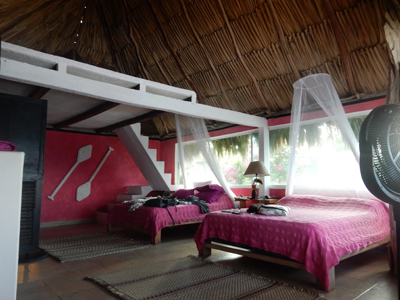 The following pictures of our amazing guesthouse, Finca Barlovento, were taken over a 3 day period. 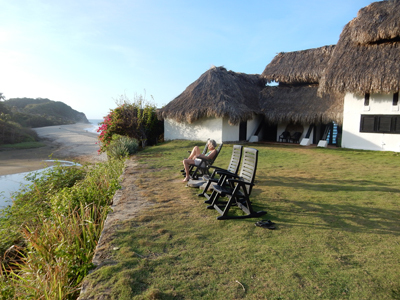 View of Finca Barlovento from the west – our accommodations for three nights. 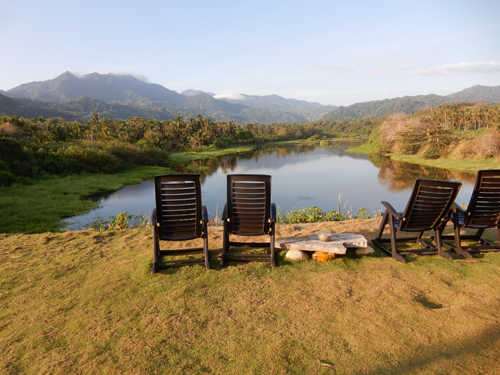 This may be the most scenic location we have ever experienced in that there was natural beauty in EVERY direction! 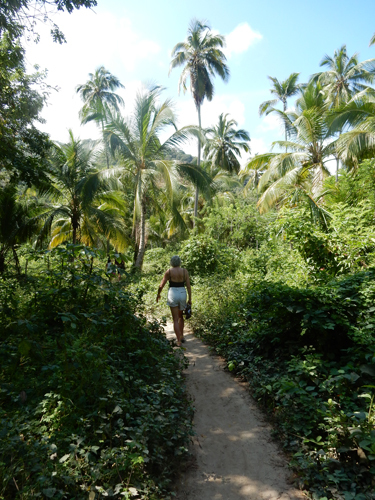 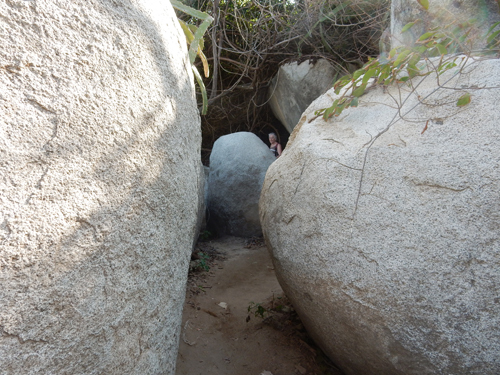 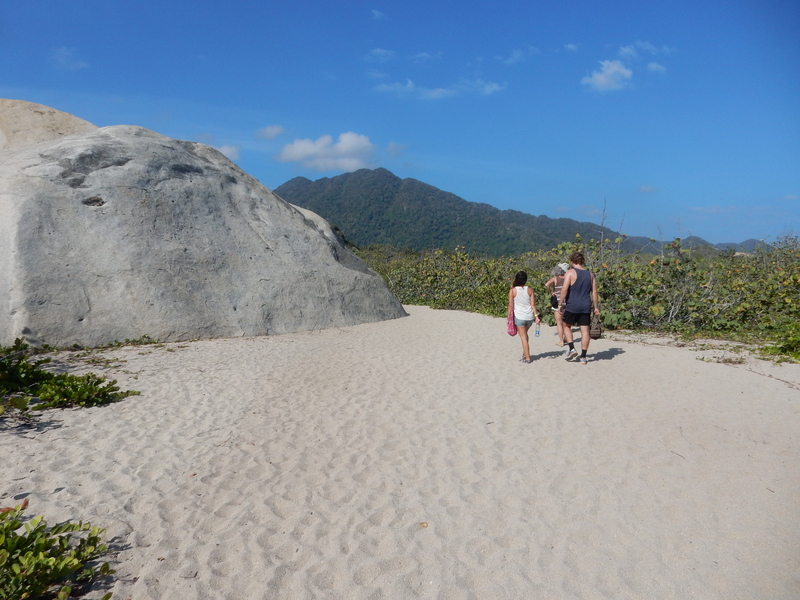 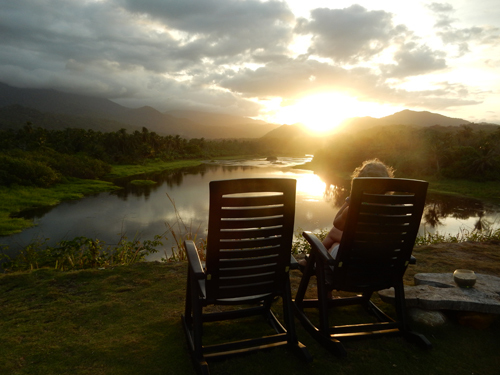 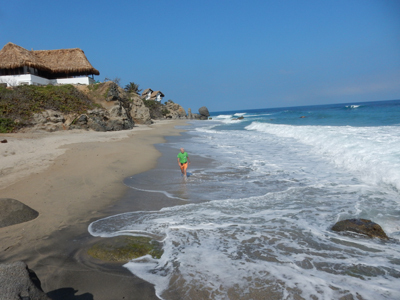 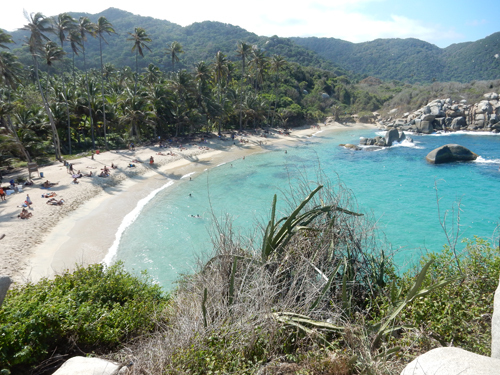 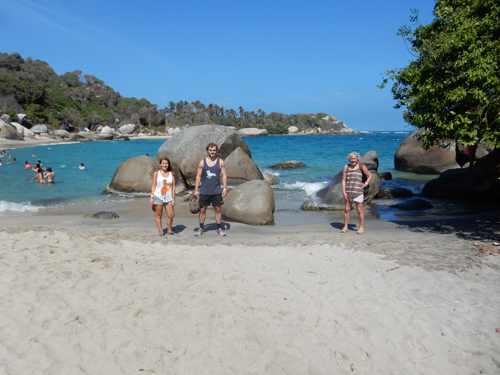 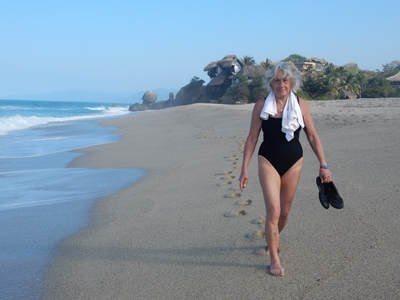 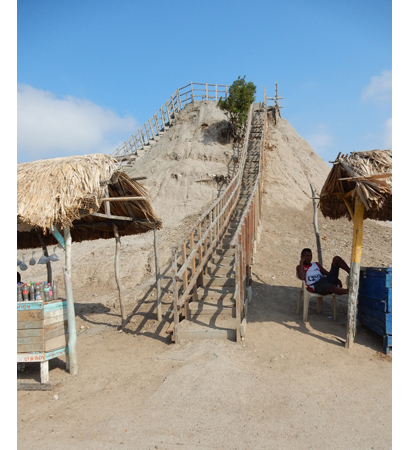 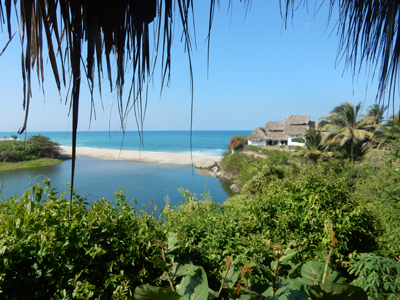 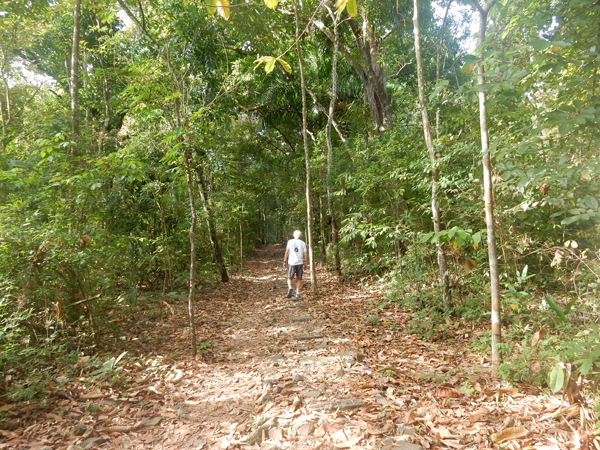 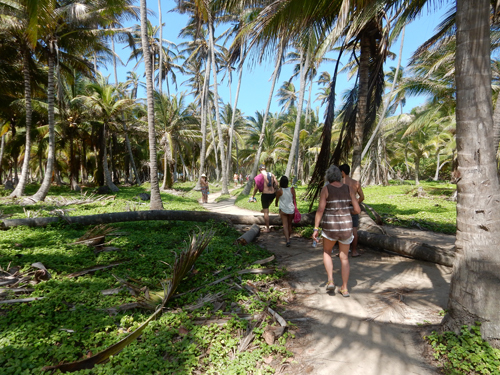 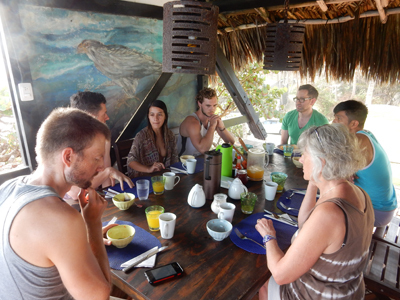 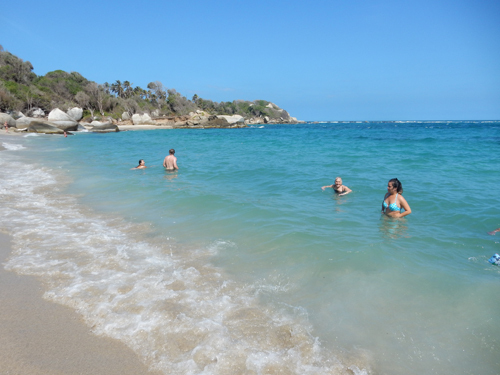 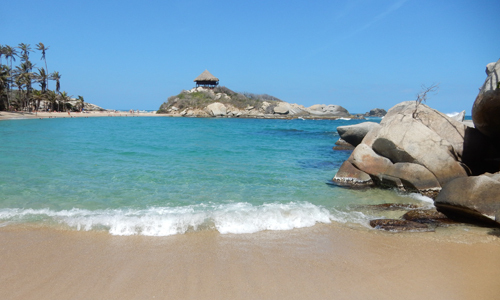 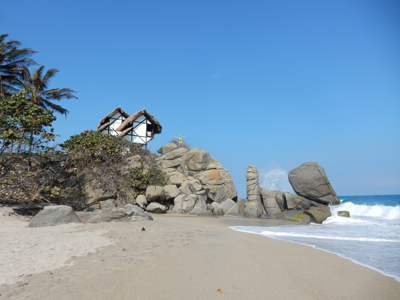 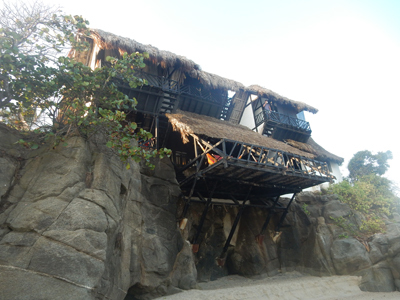 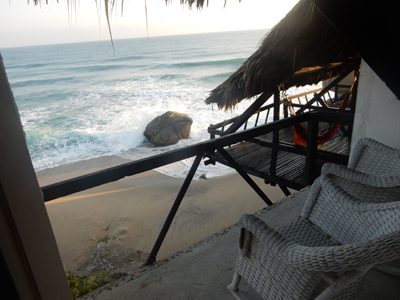 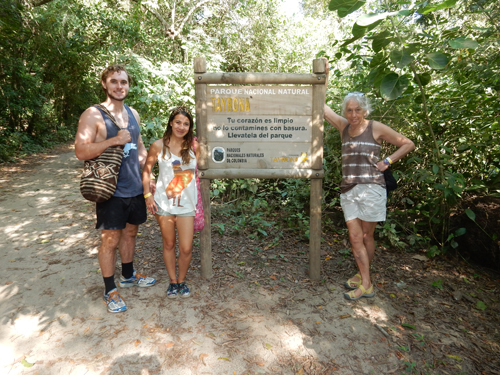 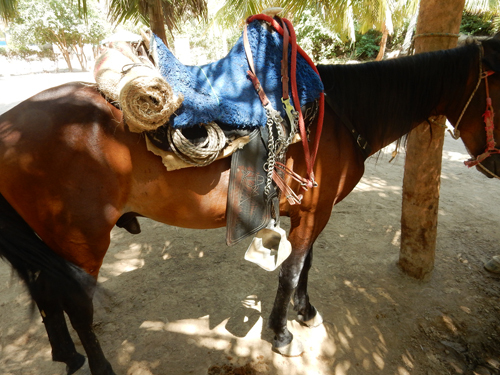 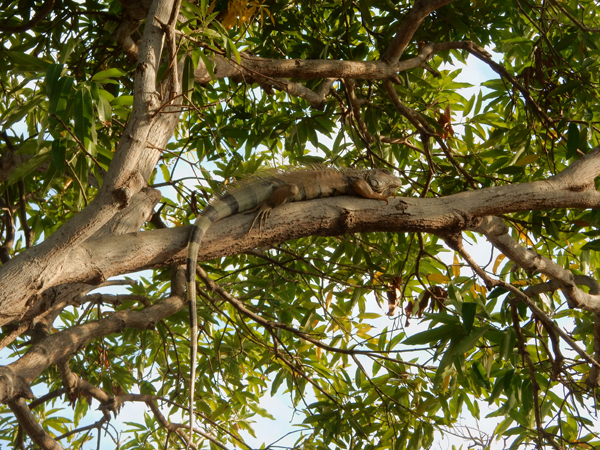 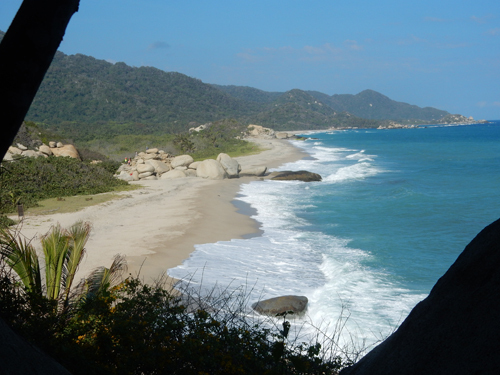 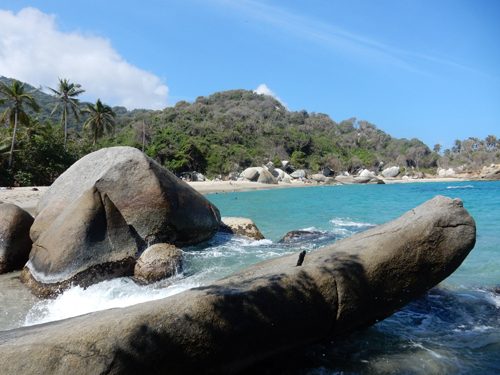 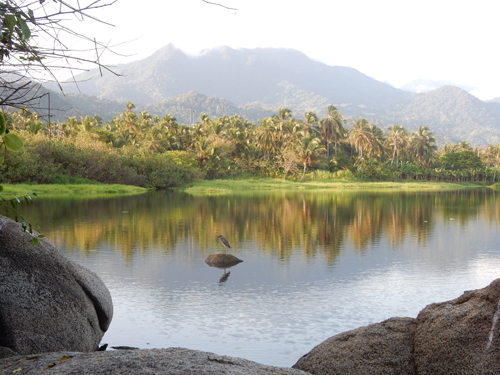 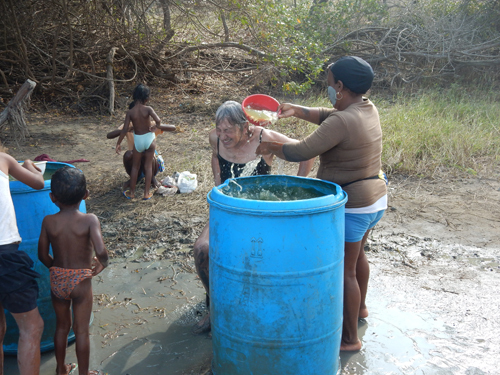 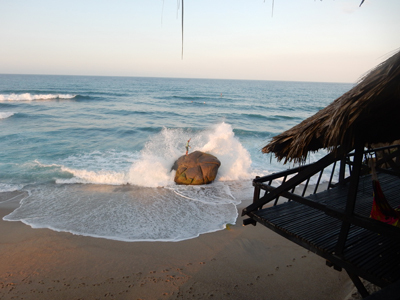 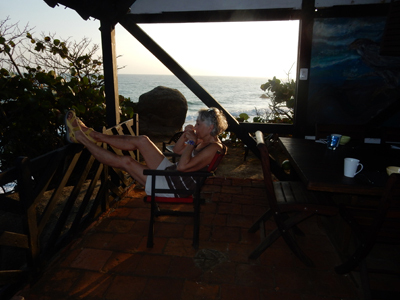 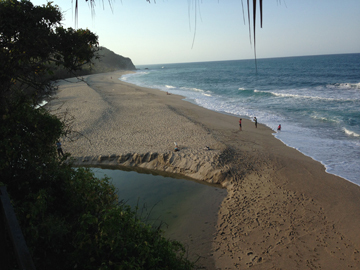 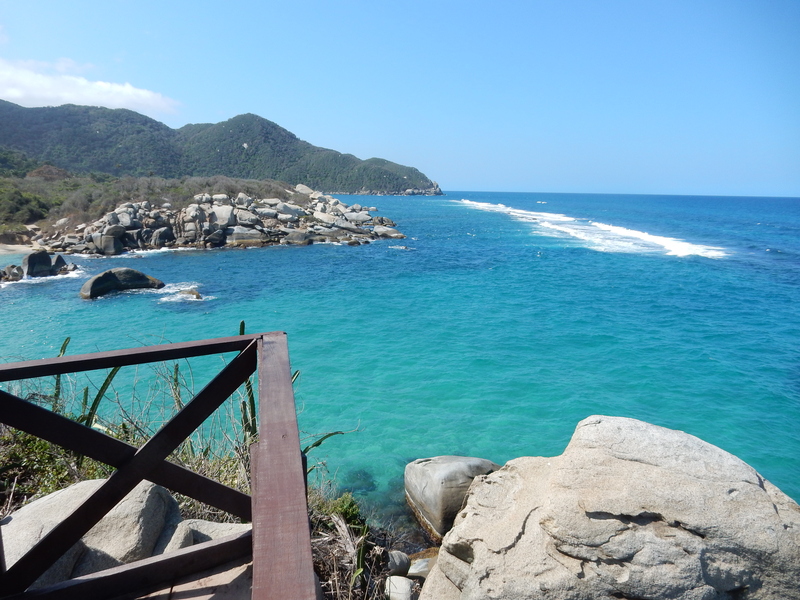 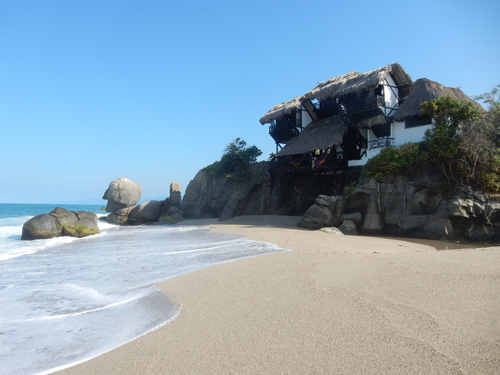 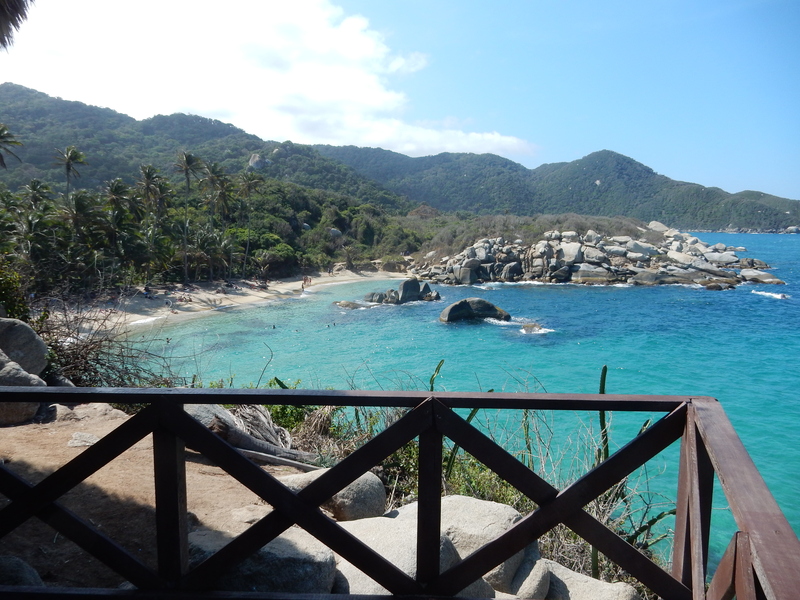 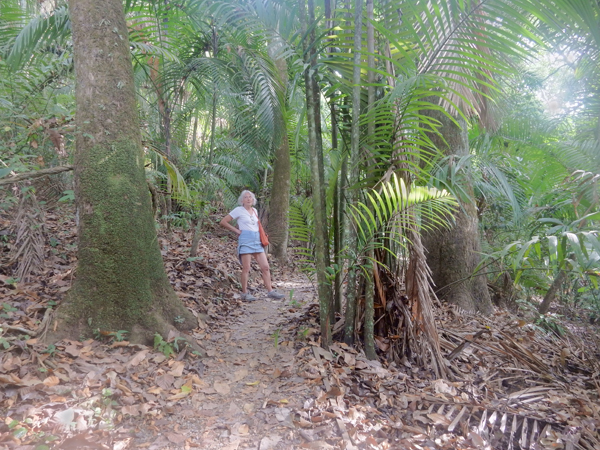 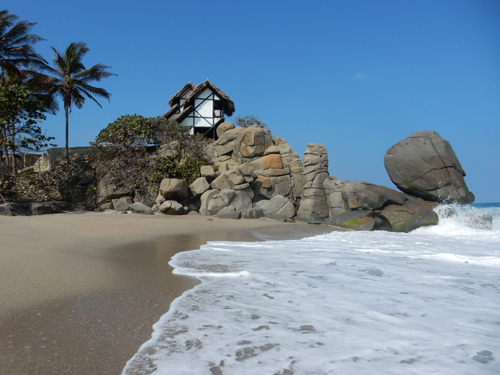 January 21 – Karla and Will from our guesthouse joined us for a full day in Tayrona NP. 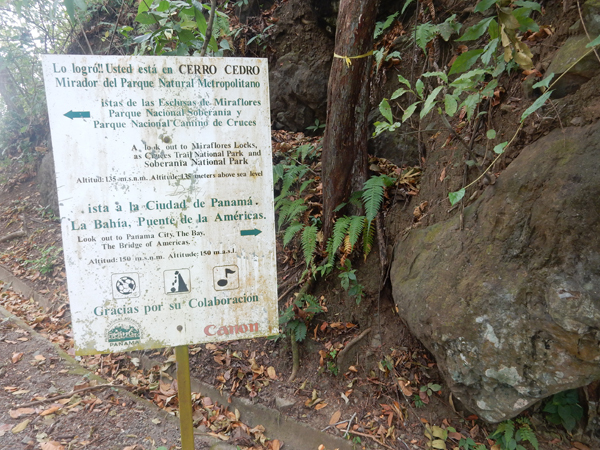 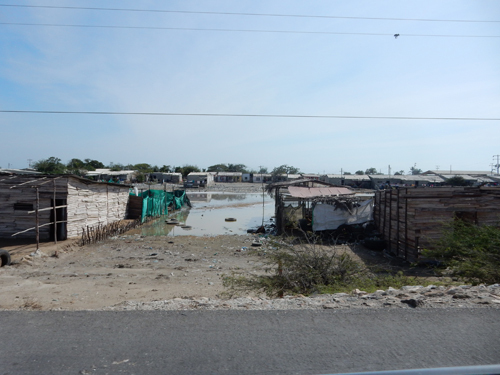 It was a short drive to the only road entrance to the park at El Zaino. 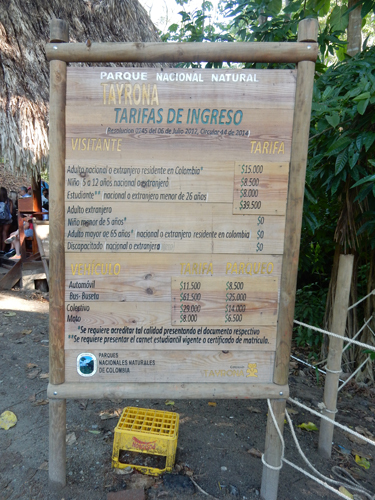 The park entrance fees are relatively expensive. 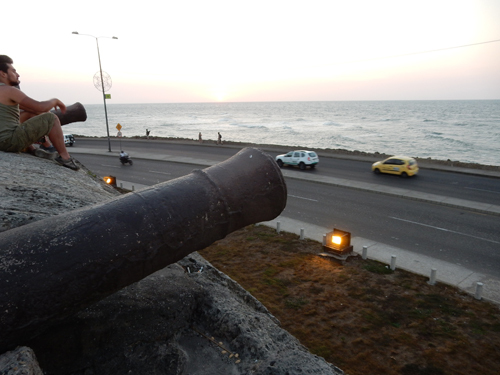 You may be checked for alcohol or glass bottles – don’t risk getting shot! 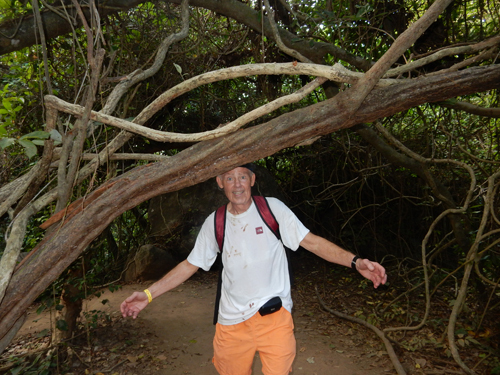 Re-creation of trail mishap – didn’t see the low tree!!! 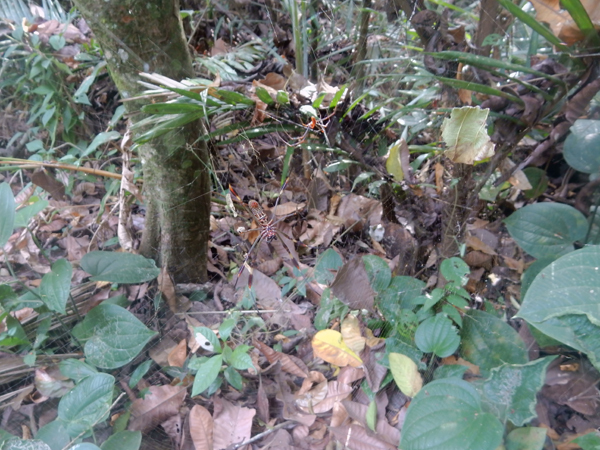 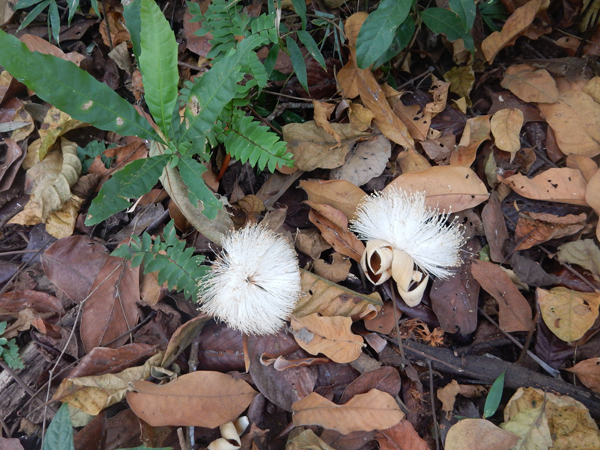 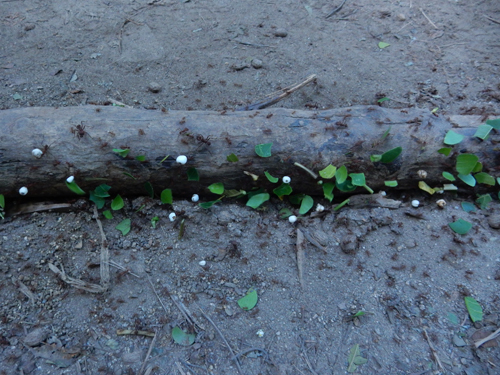 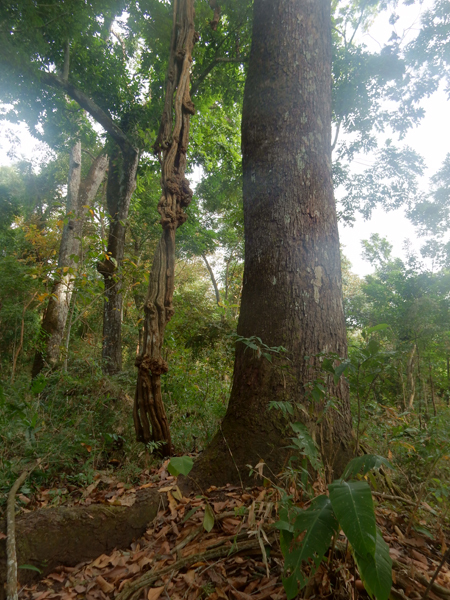 Leaf cutter ants – after all, this is the jungle! 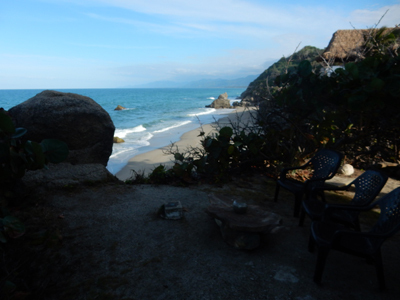 Here are progressive views from the hut toward the west cove – beautiful! 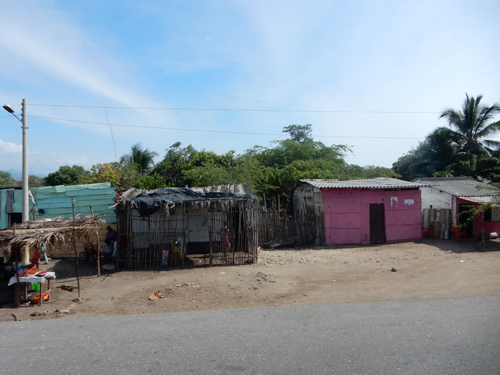 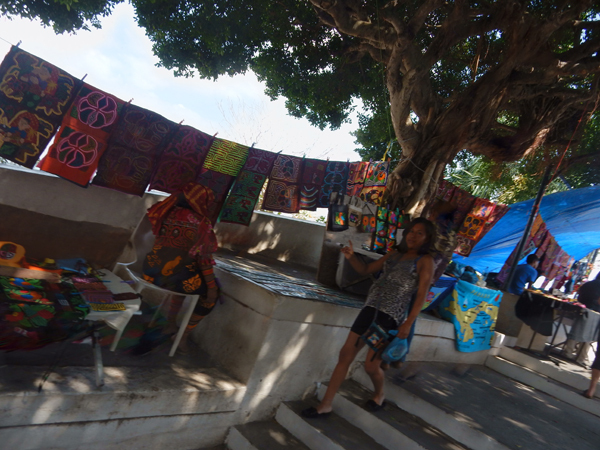 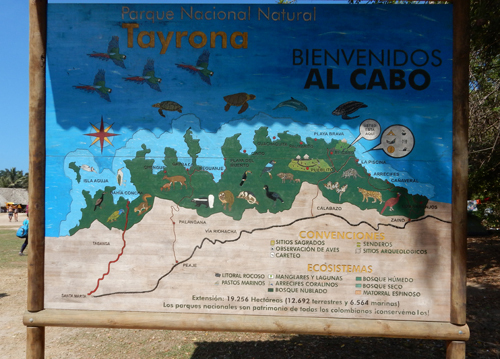 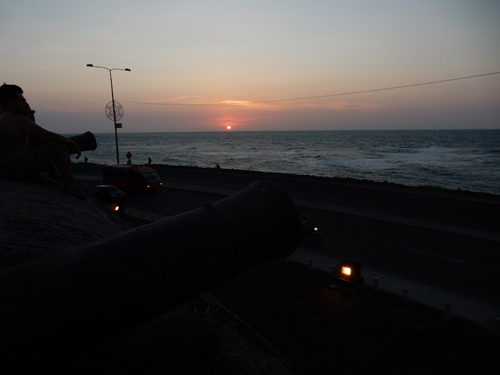 January 23 – Started driving after breakfast, stopped at Tayrona NP to buy a park T-shirt and then headed toward Cartagena. 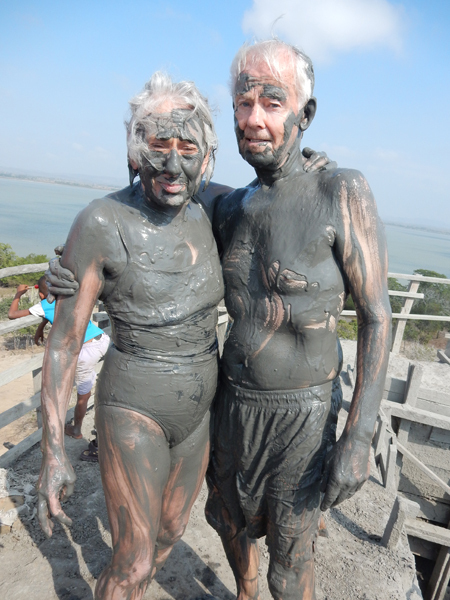 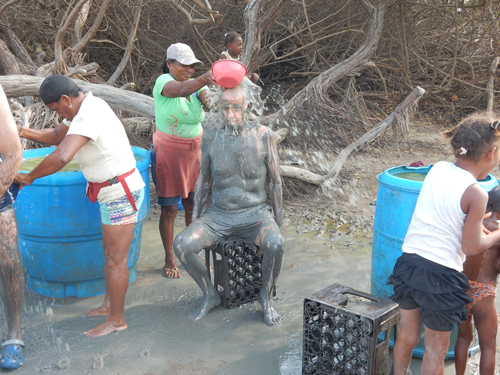 About an hour northeast of the city we stopped to experience the mud bath at Volcan de Lodo El Totumo. 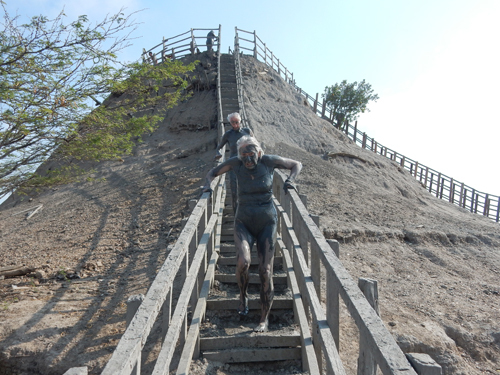 The “volcano” is a conical mud formation about 35 ft high. 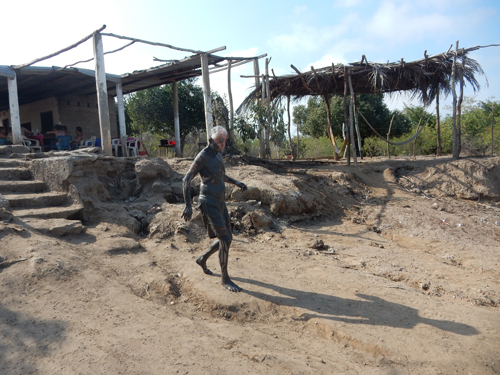 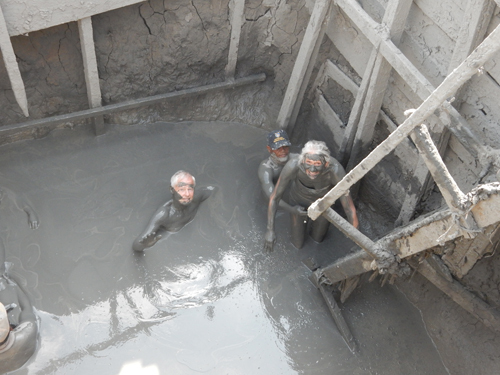 The mud is geothermally warmed and is a comfortable temperature. 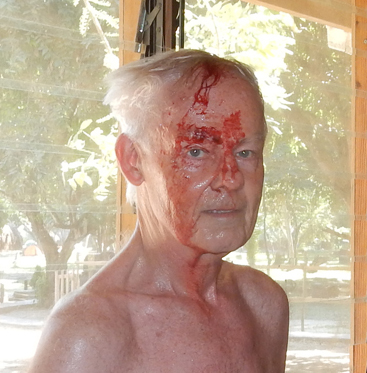 I didn’t submerge my head due to the cut I had incurred two days earlier. 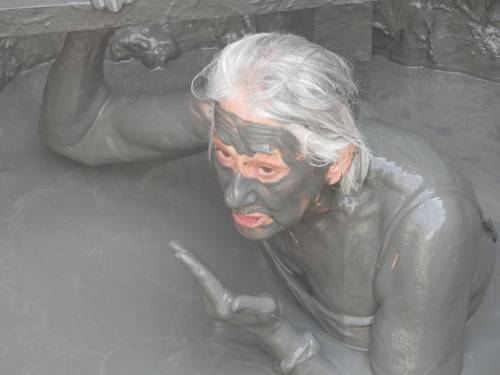 You to pay to go into the volcano, then you were expected to tip the official who took you to the top and did photographs with your camera, the massagers, the fellow who held your clothes, the woman who rinsed you off and then had to pay for the shower you needed to really get the rest (almost) of the mud off. 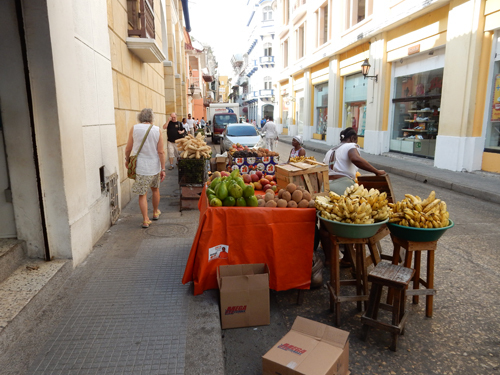 In total about $24 for both of us. 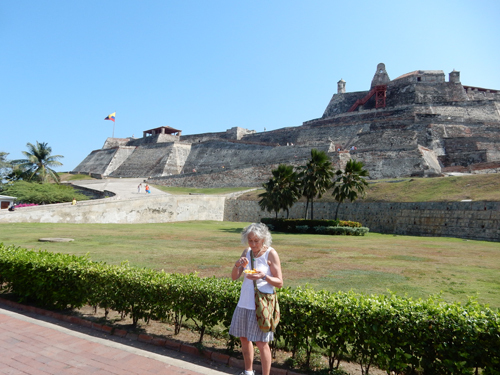 Dropped the car off at the airport, took a taxi into Cartagena, showered again, and walked to the Plaza de San Pedro Claver for iced coffees. 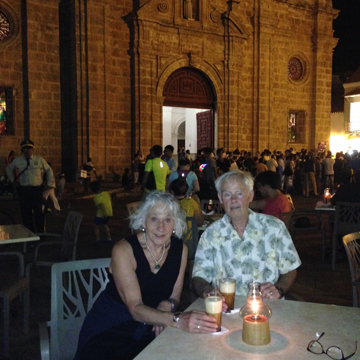 Beautiful evening, watched a wedding party exit the church with music and dancing. 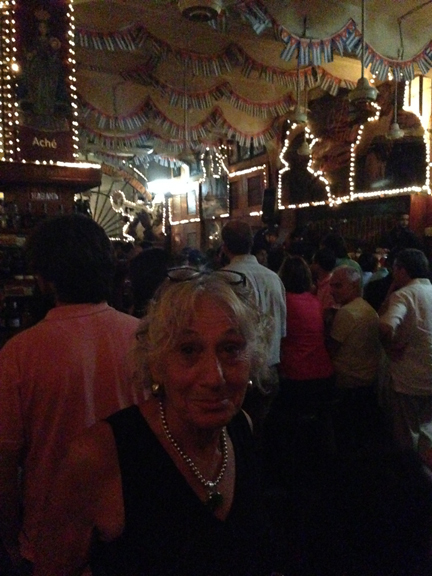 Notice the sharp looking woman with the emerald pendant! 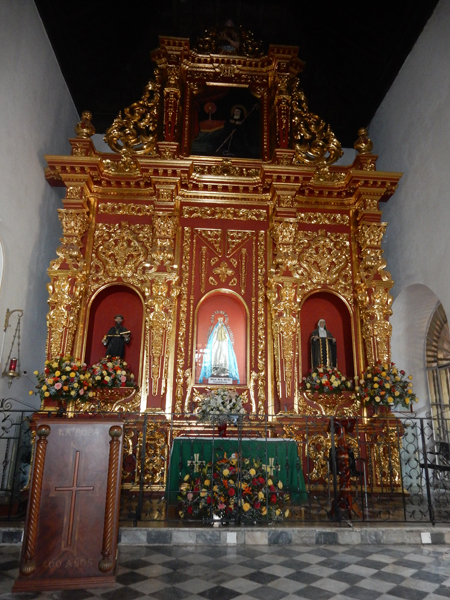 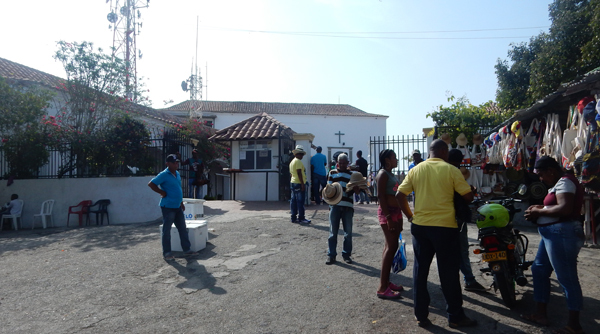 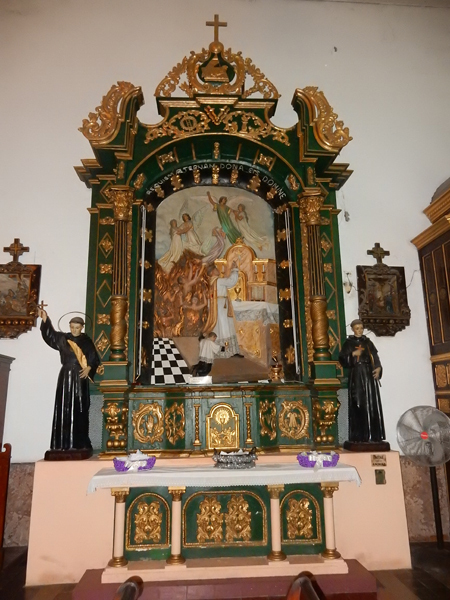 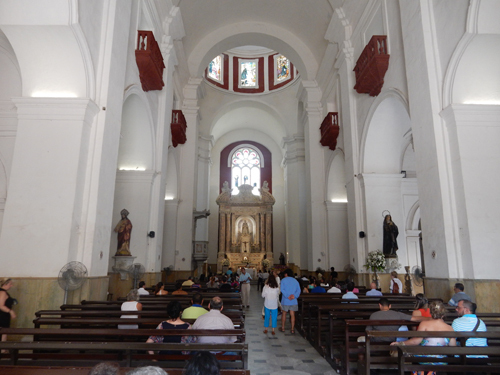 January 24 – walked to Iglesia de Santo Toribio de Mangrovejo (completed in 1732) for mass but discovered we would have to wait over an hour. 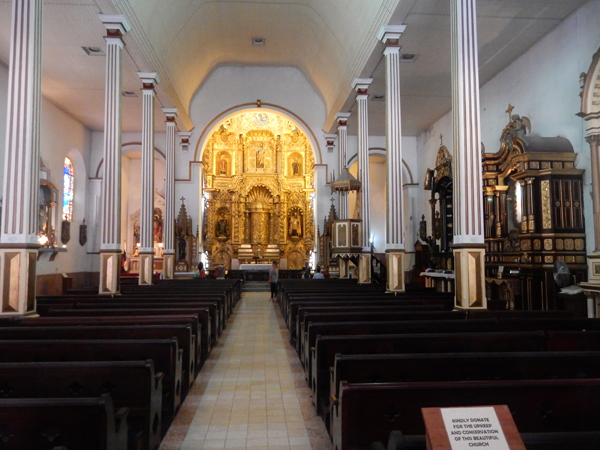 So we continued to Iglesia de San Pedro Claver. 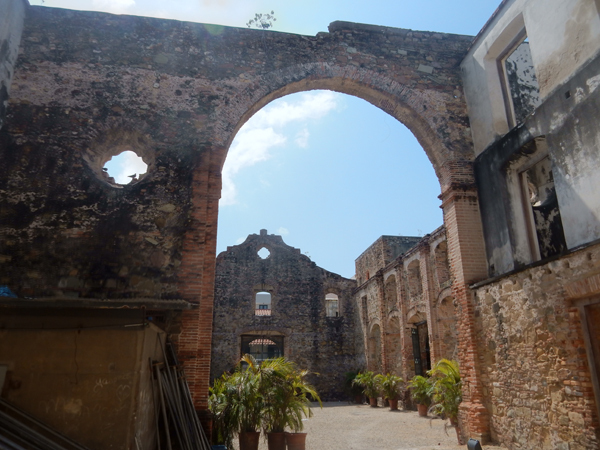 it is named for the Spanish monk Pedro Claver (1580-1654) who lived and died in the adjacent convent. 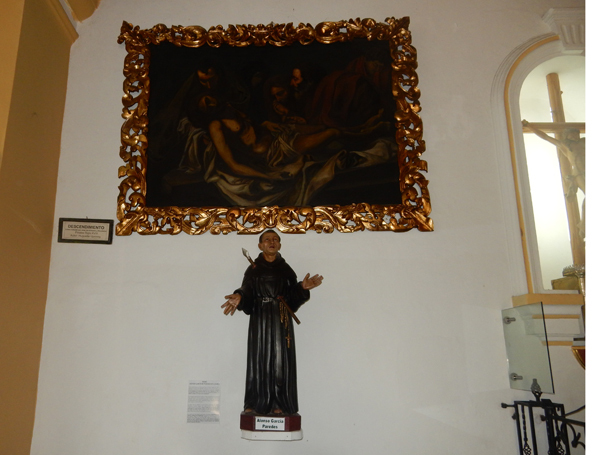 He is called the “Apostle of the Blacks” or the “Slave of the Slaves” for spending his life ministering to enslaved people brought from Africa. 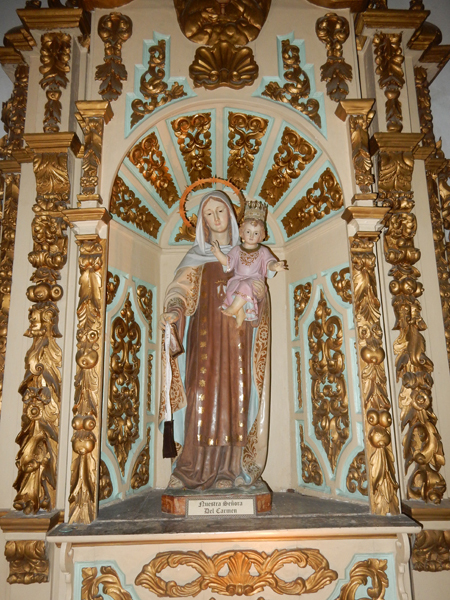 He was the first person in the New World to be canonized a saint (1888). 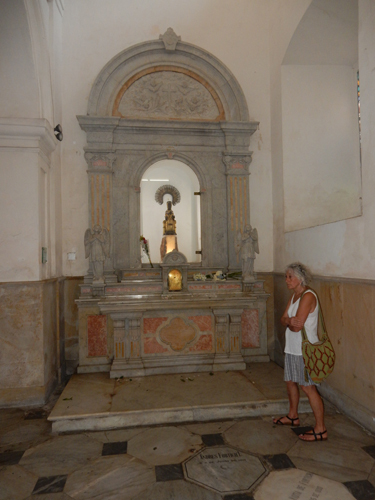 He is buried in a glass coffin (can see his skull) in the Italian marble altar. 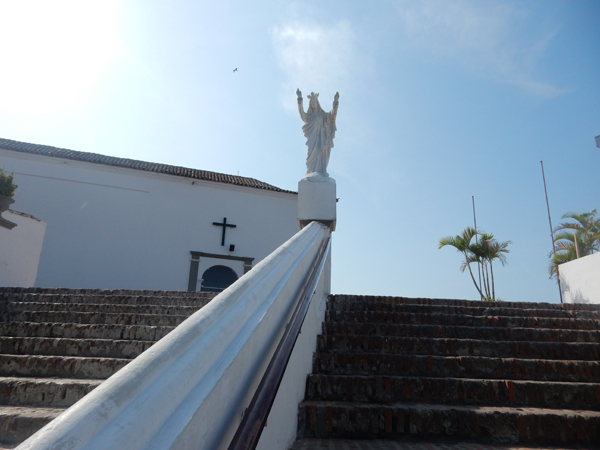 Entrance to Convent and Chapel, which was founded in 1607. 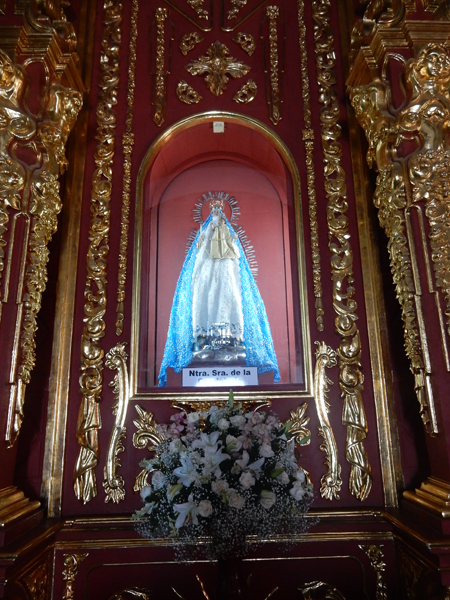 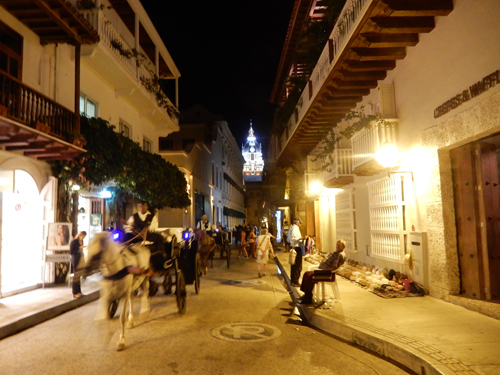 On February 2, the Fiesta de Nuestra Senora de la Candelaria, thousands of pilgrims process up the hill to honor Cartagena’s patron saint – La Virgen de la Candelaria. 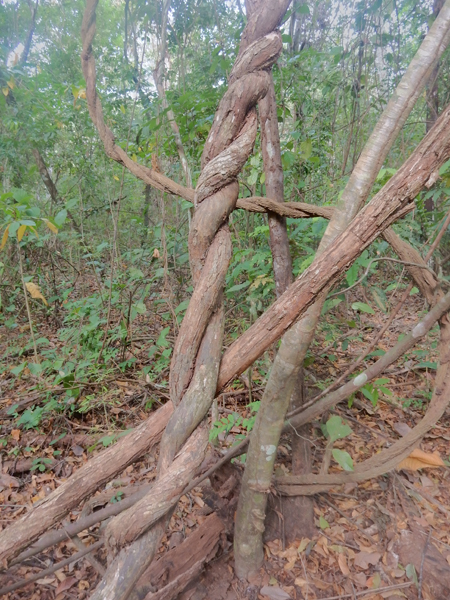 We missed it by a week. 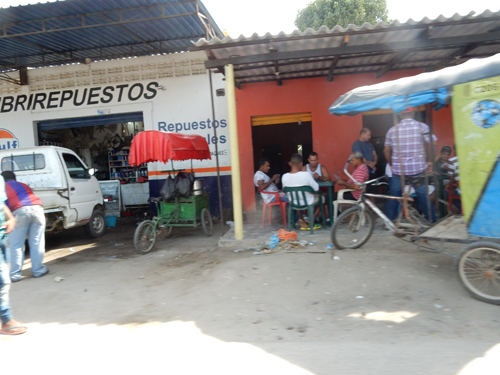 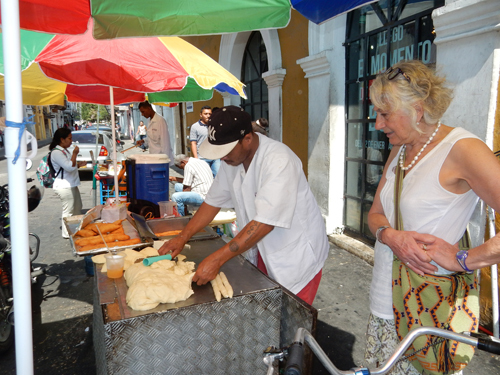 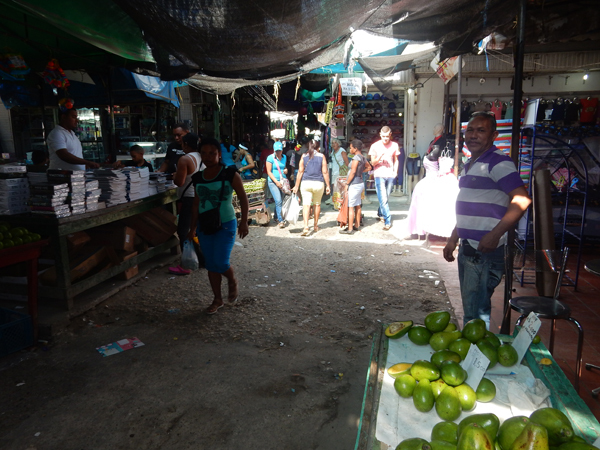 Next stop was Mercado Bazurto – Cartegena’s 24 hr central market. 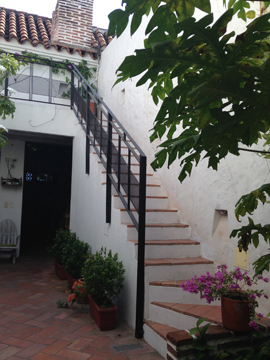 It is a labyrinth of alleyways offering about anything you might desire. 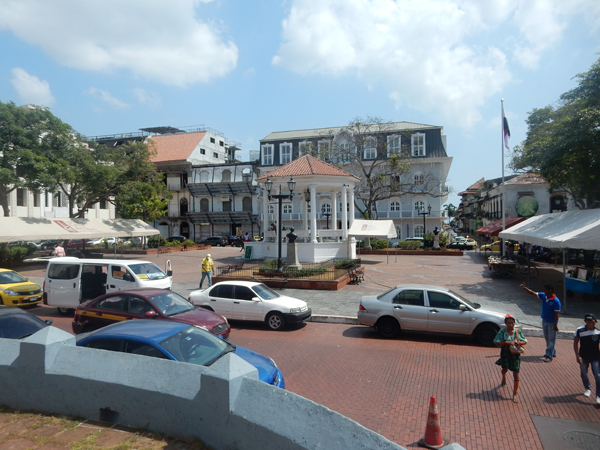 Did a last visit to the central Old Town in the early afternoon. 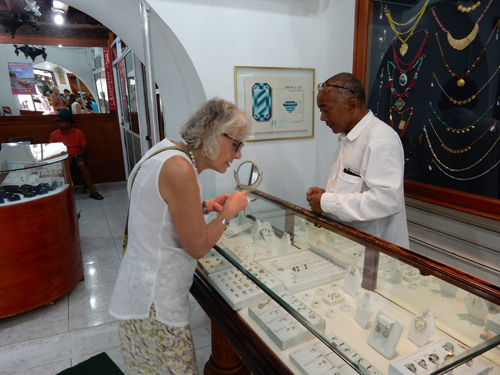 I commissioned a silver pinky ring for Helen from Silver Smith Jose Baza (Fabricacion y Reparacion de Joyas). 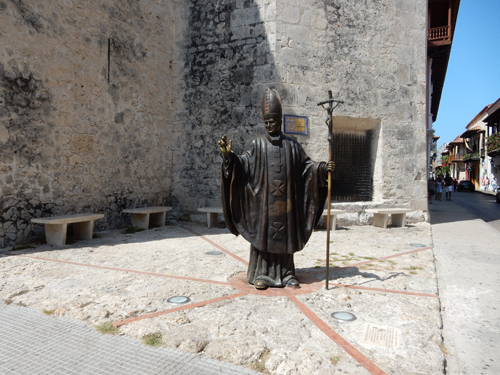 His little shop is across the street from this statue of Pope John Paul II who visited Cartagena in 1986. 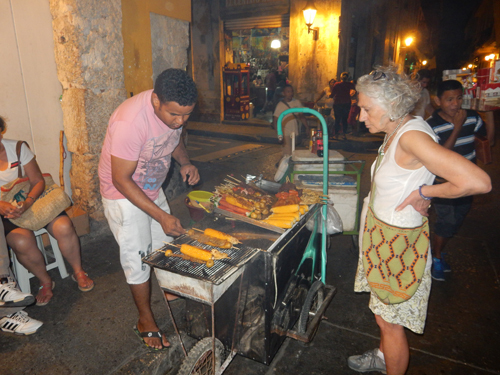 Helen specified style and size and Jose took the measurements. 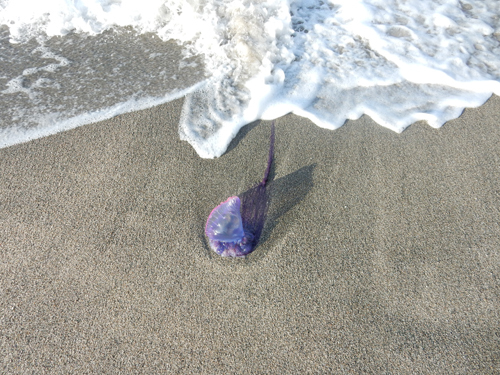 We picked it up one hour later. 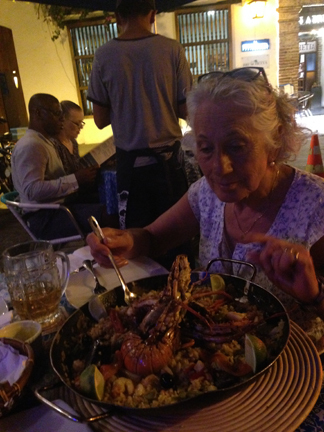 Celebrating our Colombian adventures with the Ultimate Paella Seafood Platter!!! 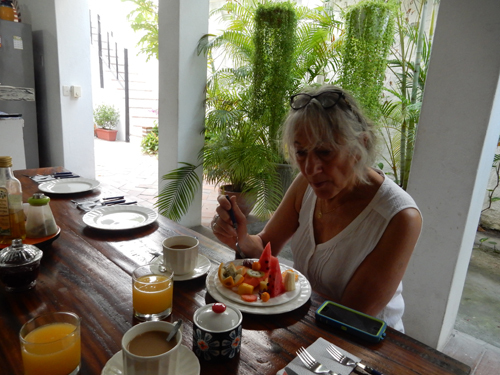 January 26 – Helen’s Birthday! 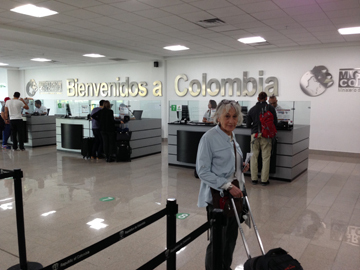 Unfortunately, our morning Avianca flight to Bogota was a couple of hours late, which meant we had to reschedule the flight from Bogota to Panama City. 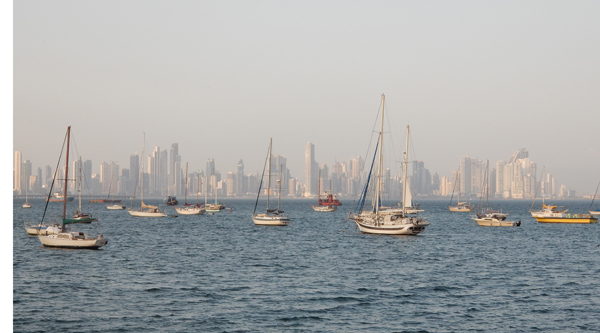 Long story short, we arrived at our hotel in Panama City at 1am. 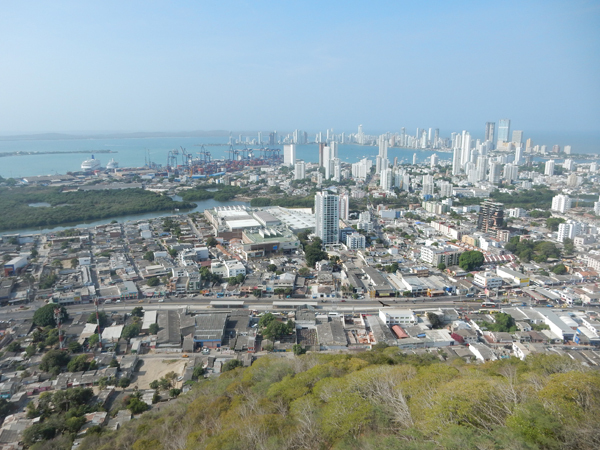 You can fly from Cartagena directly to Panama City in less than an hour but the only airline to fly that route, the Colombian airline COPA, charges almost twice the Cartagena to Bogota to Panama City fare – they know they gotcha! 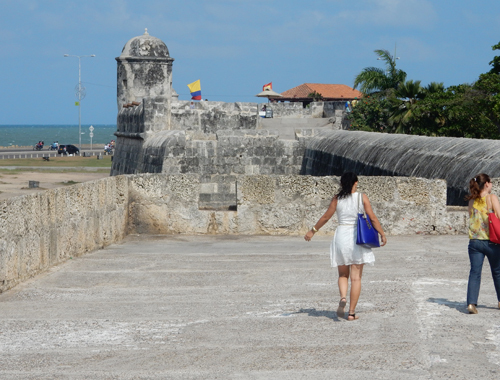 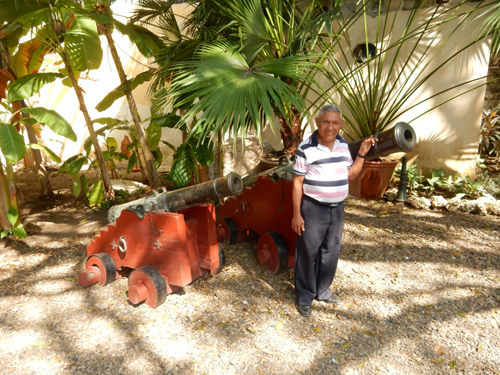 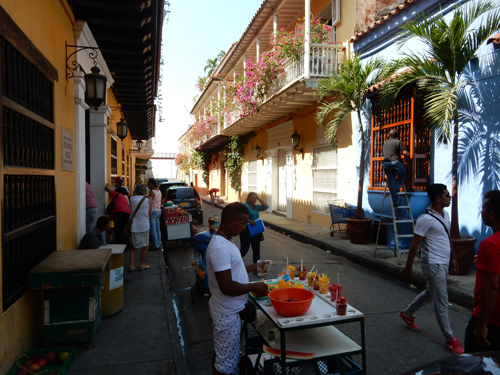 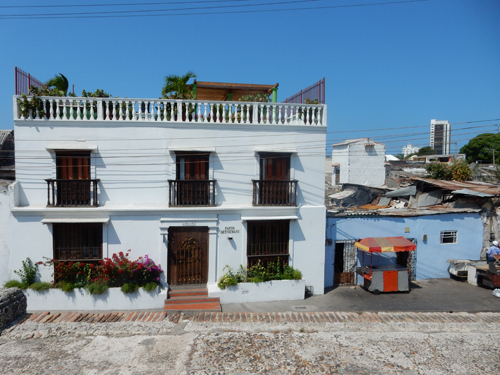 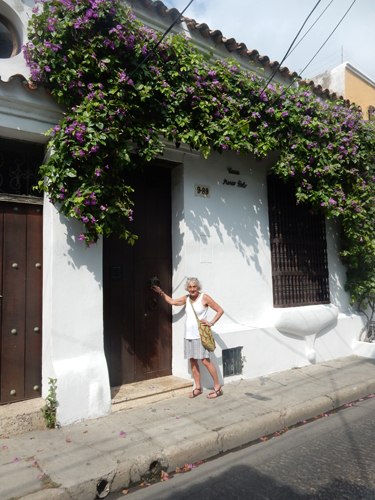 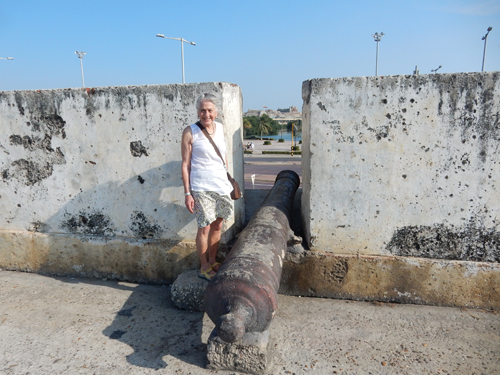 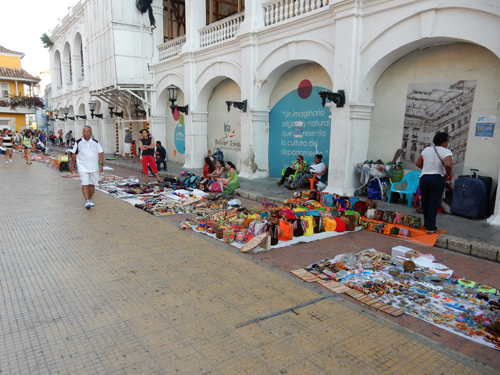 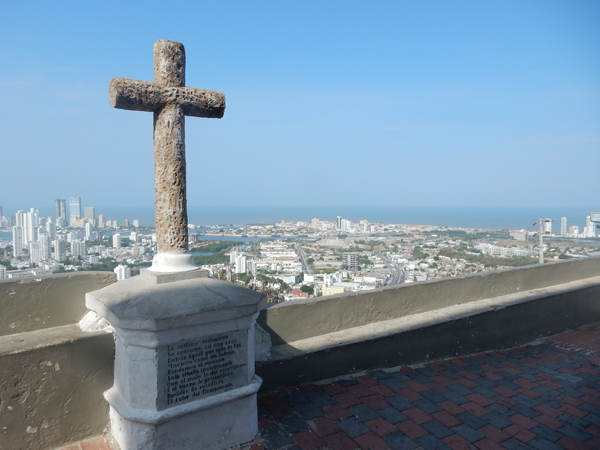 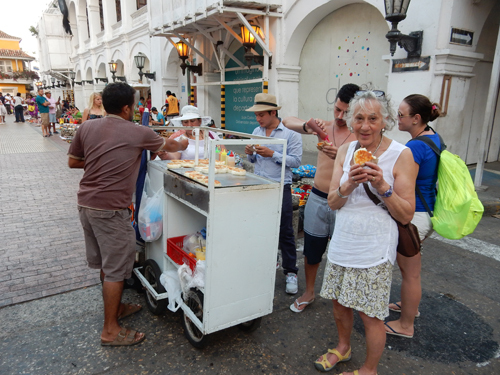 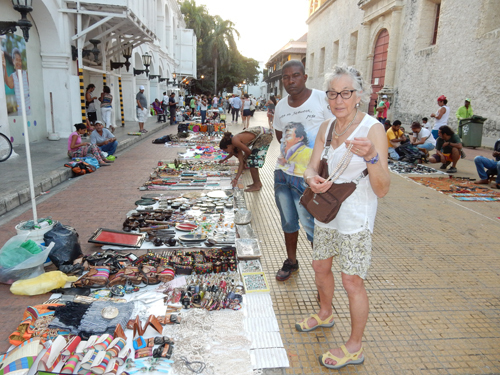 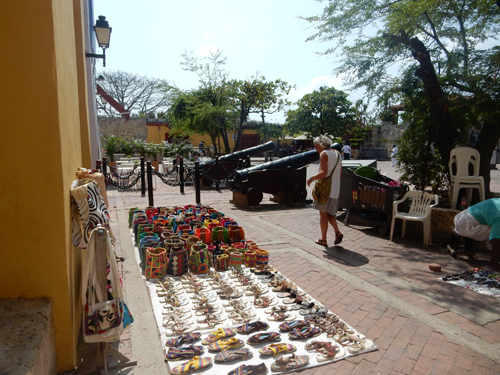 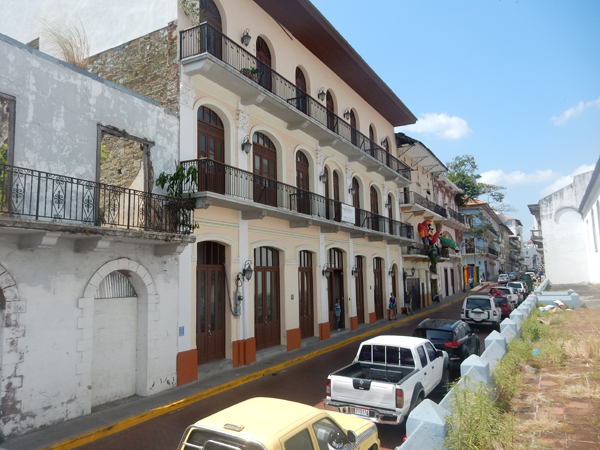 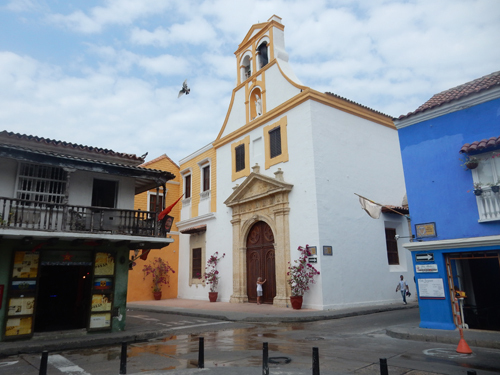 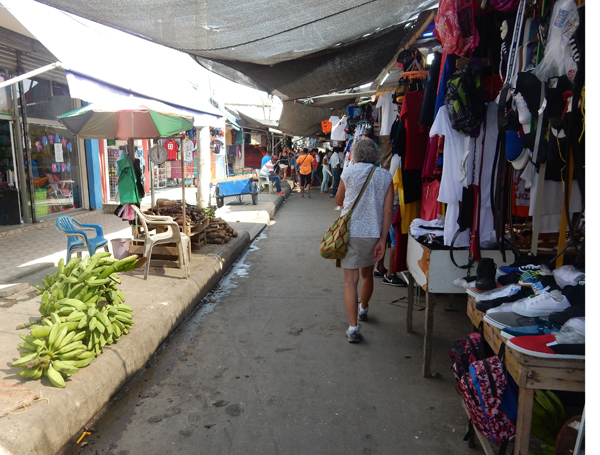 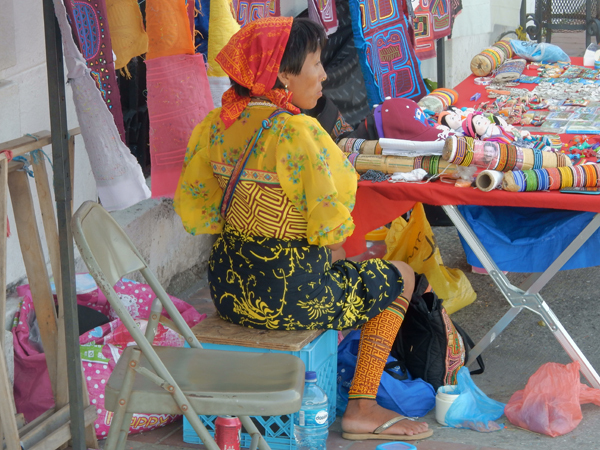 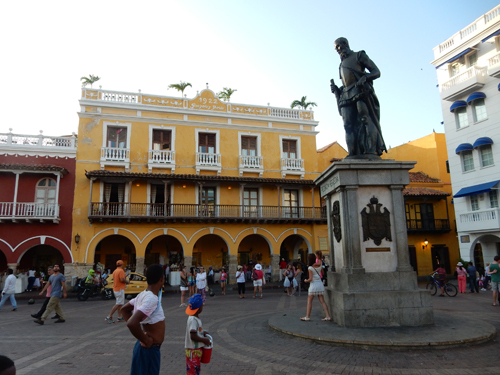 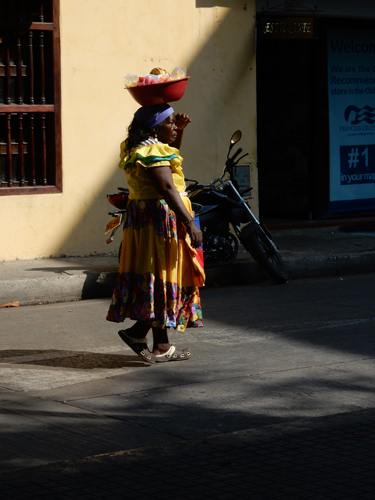 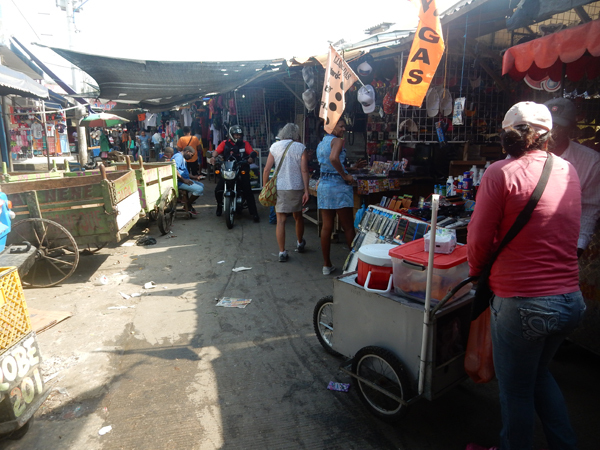 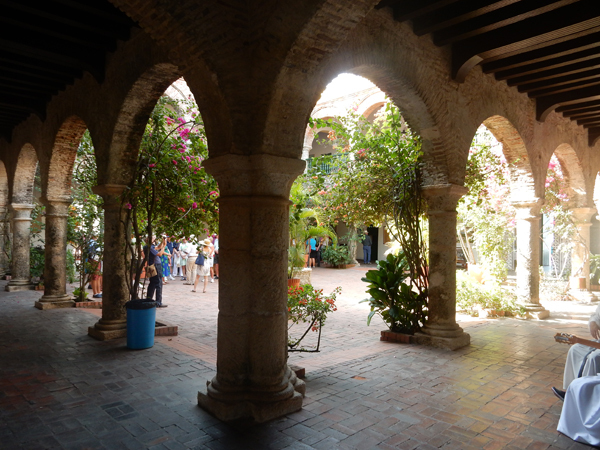 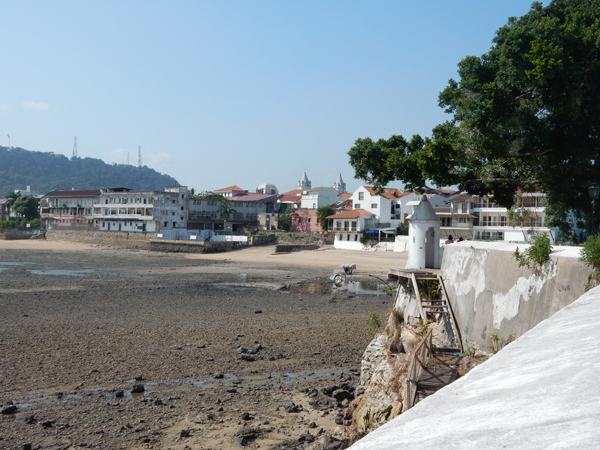 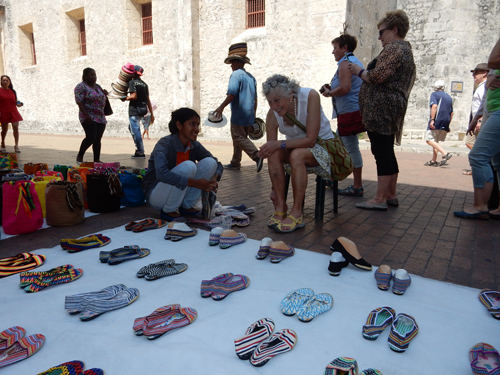 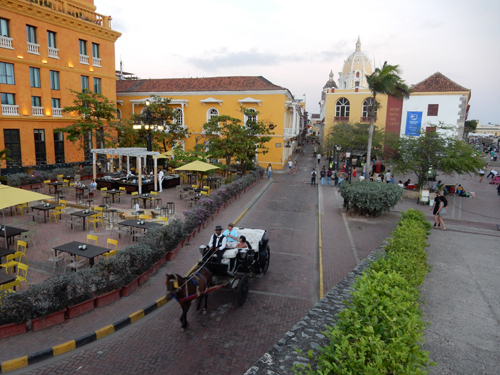 January 27 – decided to tour Casco Viejo (Old City) on our first day in Panama. 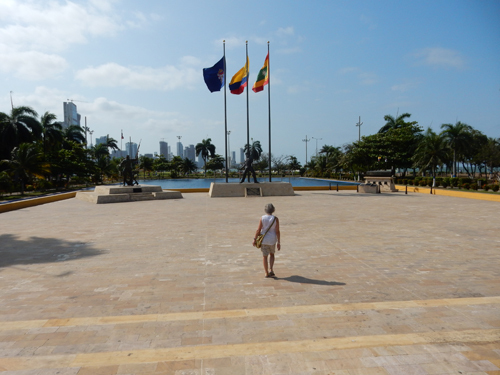 The weather was the same as in Colombia – hot. 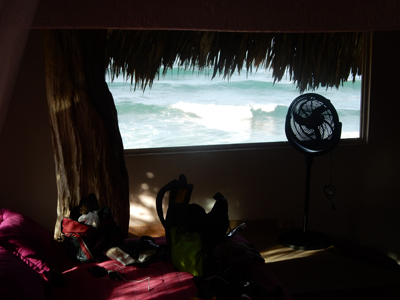 We’re not complaining, that’s what we wanted on this trip. 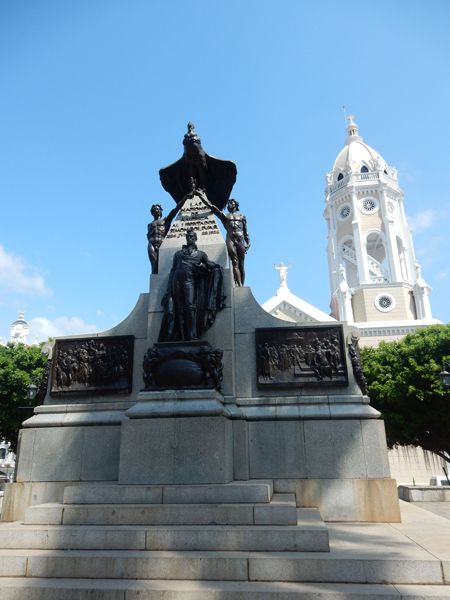 We started by visiting the Panama Canal Museum (Museo del Canal Interoceanico) and then the Catedral Metropolitana (begun 1688, completed 1796). 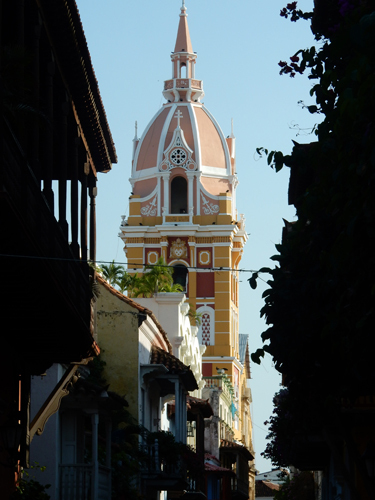 The bell towers are inlaid with mother-of-pearl. 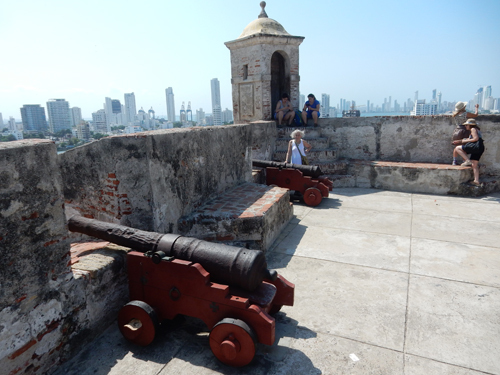 It was host to the signing of the declaration of independence of Panama from Colombia in 1903. 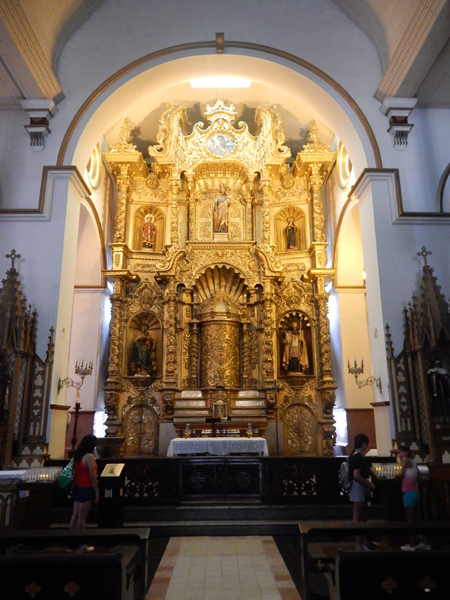 Beautiful baroque altar of Iglesia de San Jose. 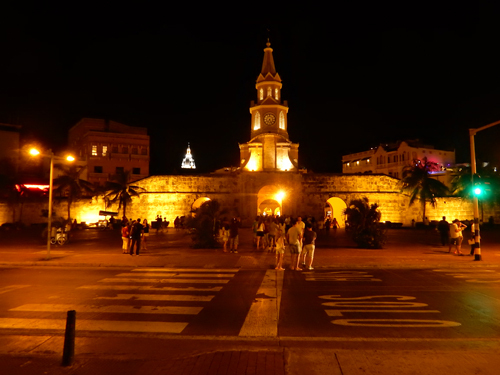 According to legend, it was painted black the night before Pirate Henry Morgan’s sack of the city and afterward moved to its current location. 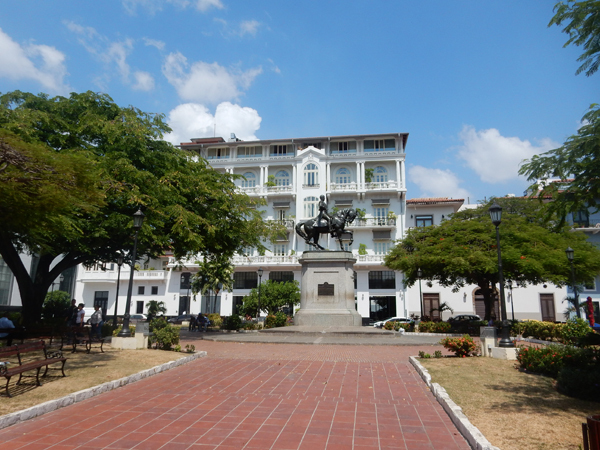 Palacio Bolivar, a former convent where a congress of Latin American union was held in 1826. 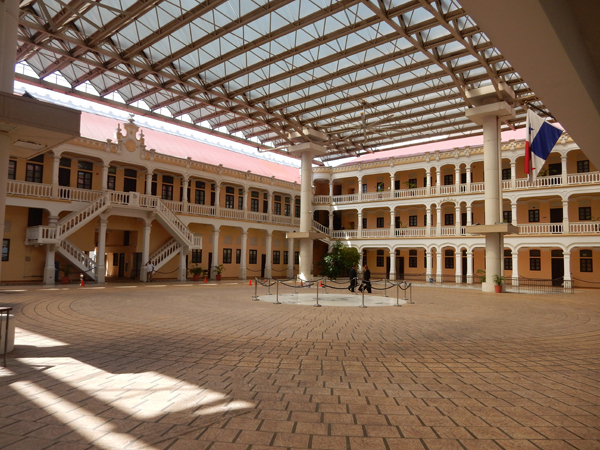 It is now the Foreign Ministry. 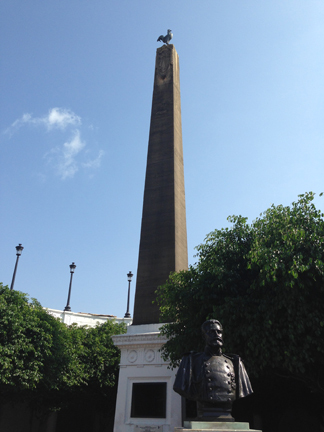 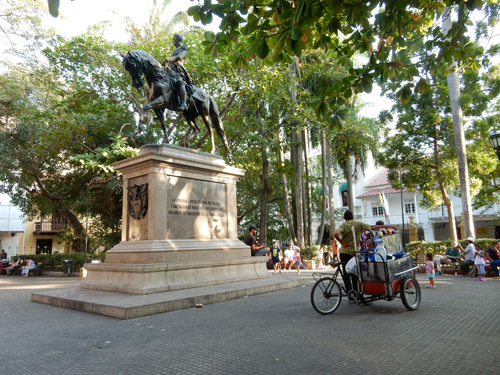 The Plaza de Francia is located on a prominent point right below the French Embassy. 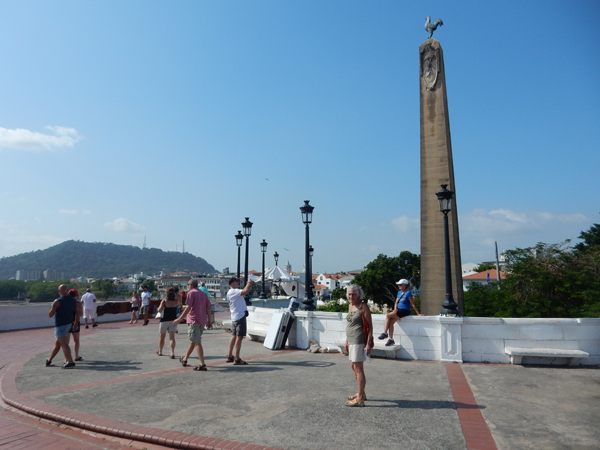 The obelisk topped with a Gallic cockerel is to honor the French for their pioneering attempt to build the Panama Canal. 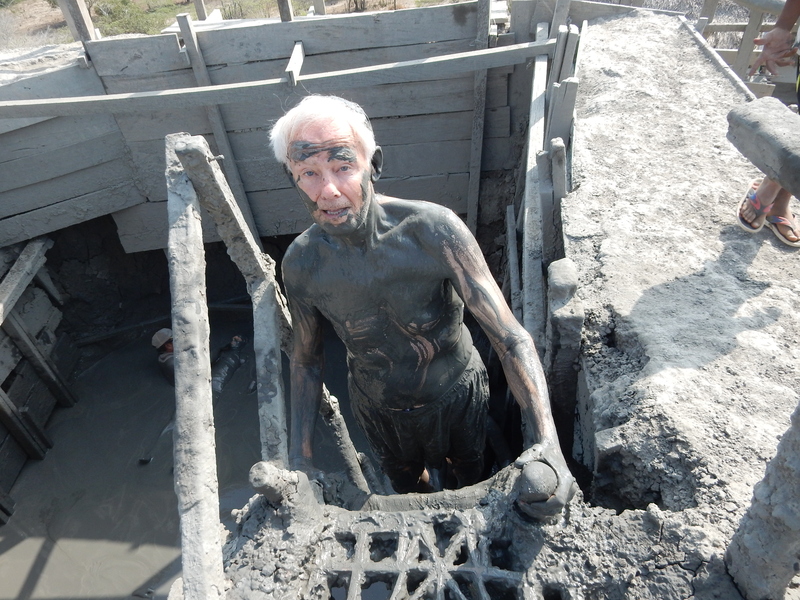 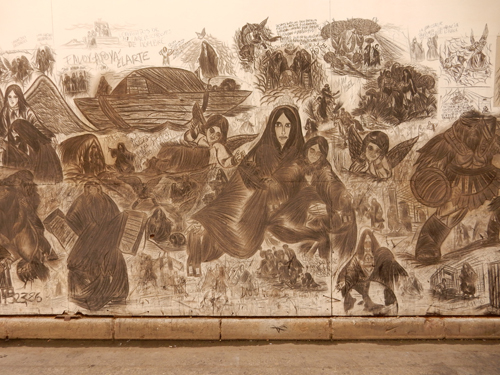 Ferdinand de Lesseps – 22,000 workers lost their lives in building the canal! 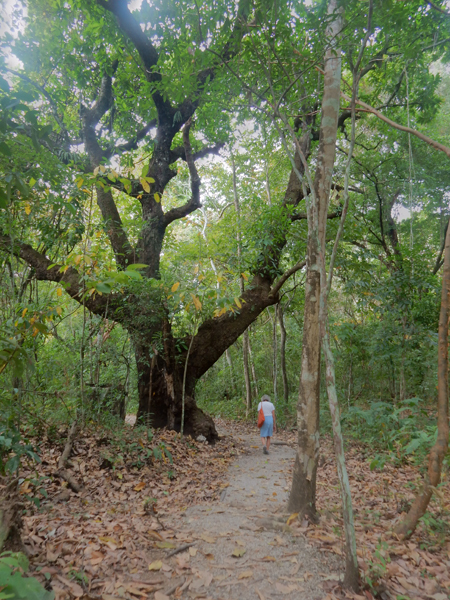 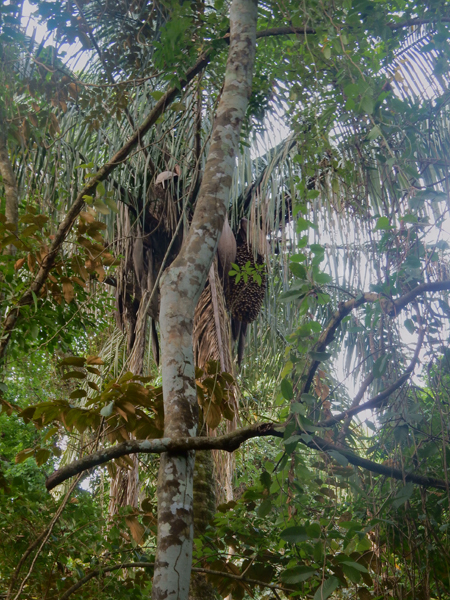 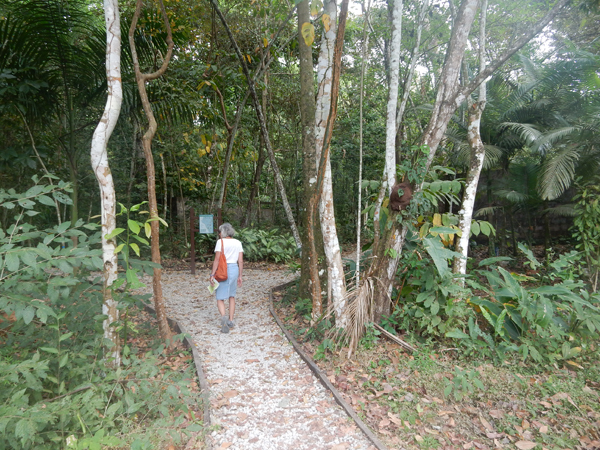 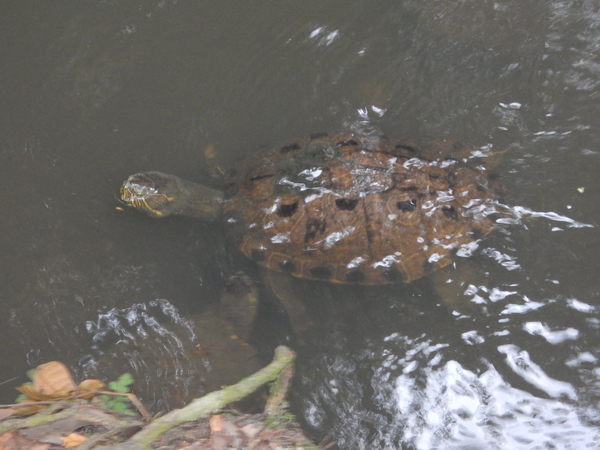 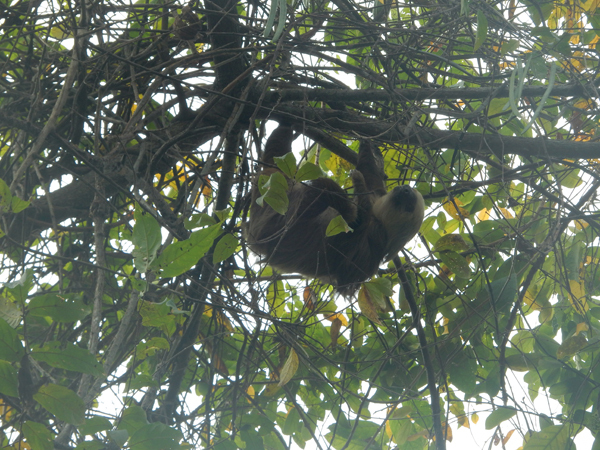 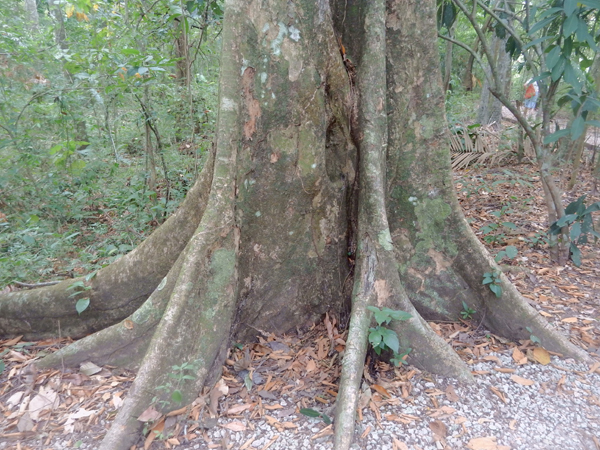 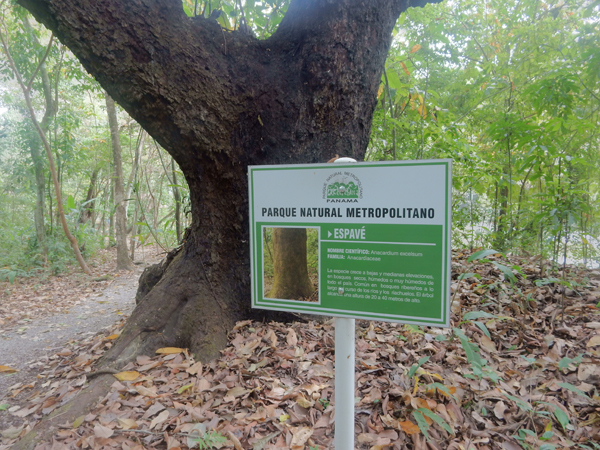 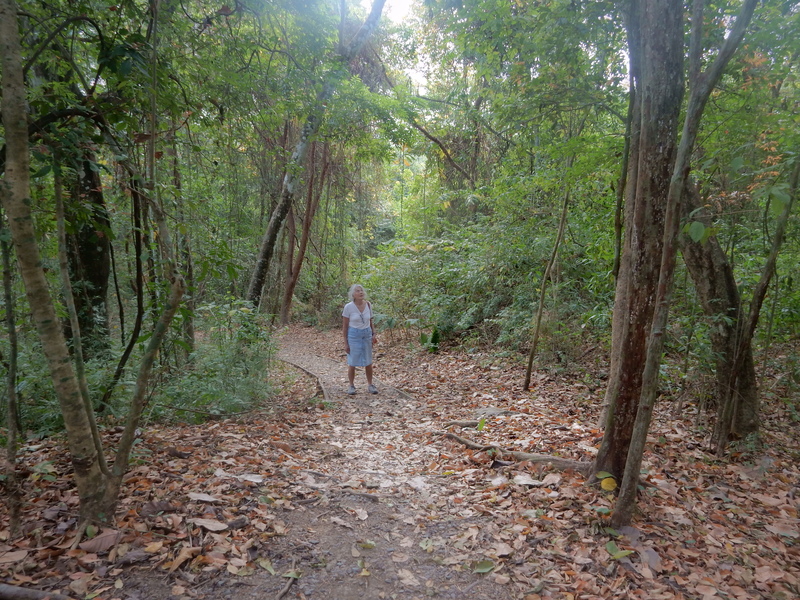 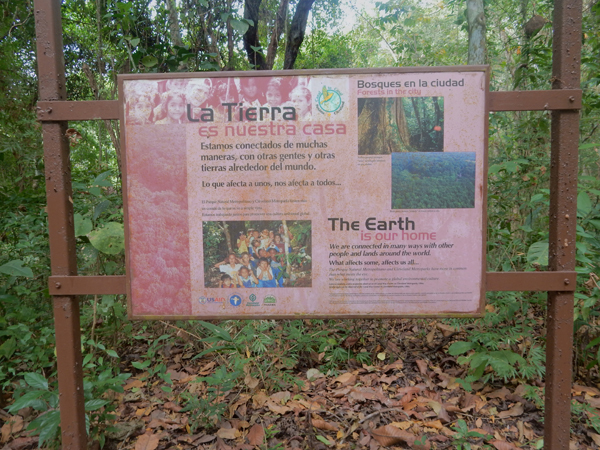 January 28 – Visited Parque Natural Metropolitana in the morning – tropical America’s only wildlife refuge and forest within city limits (573 acres). 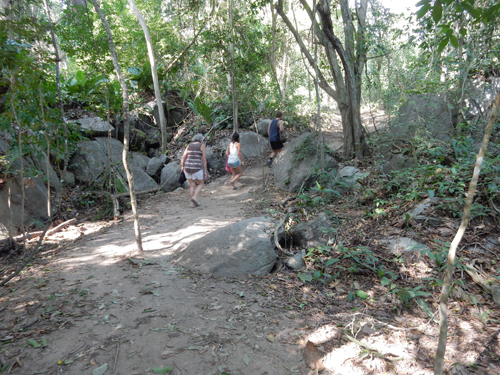 Enjoyed walking the trails but the pollution of the city is having its effects on this national park. 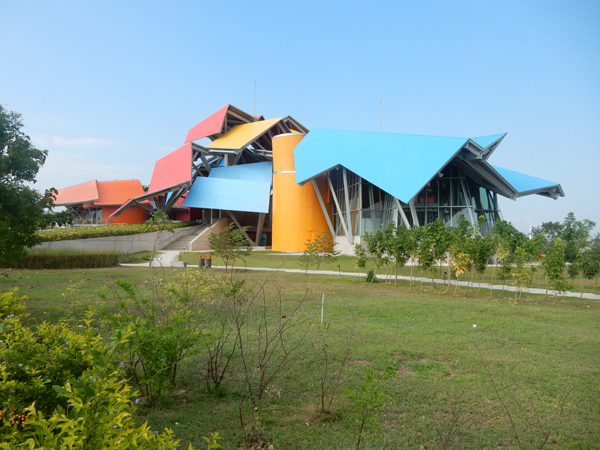 We started our afternoon by walking to the impressive Biomuseo, which opened in 2014. 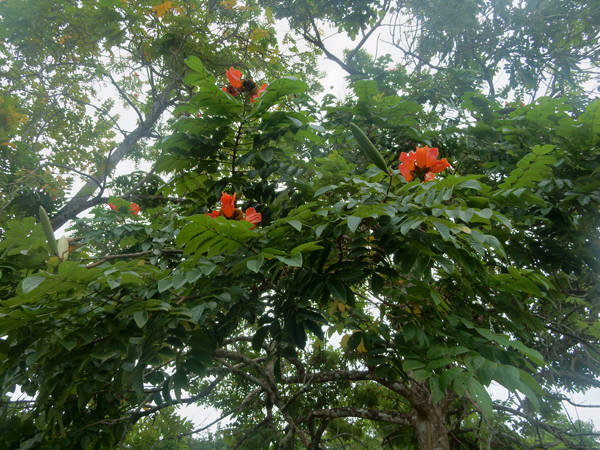 It is multicolored-shaped and meant to represent the branches and leaves of a tree and the forces of nature. 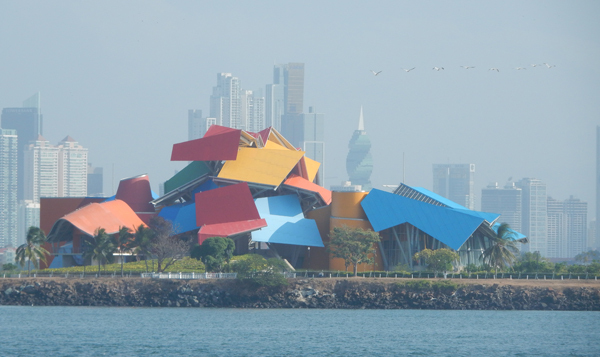 Panama hopes it will become a symbol of the city, much like the Opera House in Sydney. 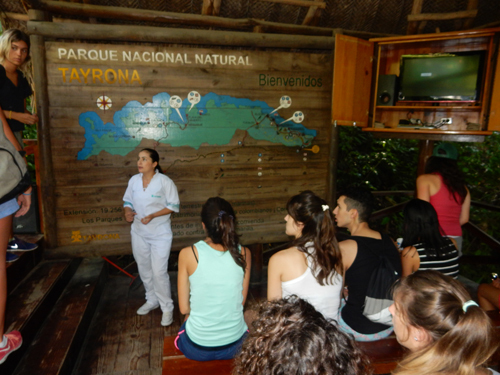 The museum has eight multimedia exhibition halls showcasing Panama’s tremendous biodiversity. 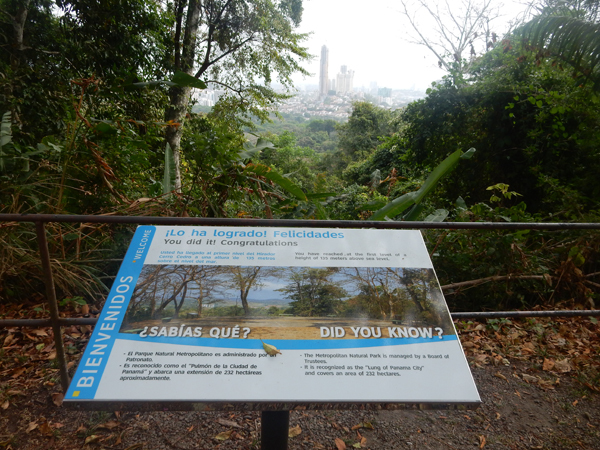 It also does an excellent job of covering Panama’s history in Spanish and English. 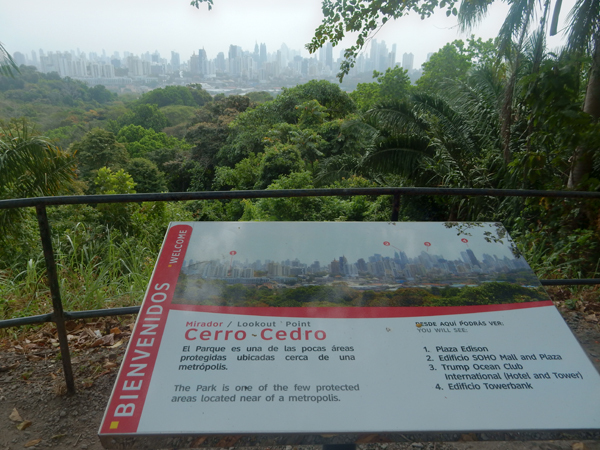 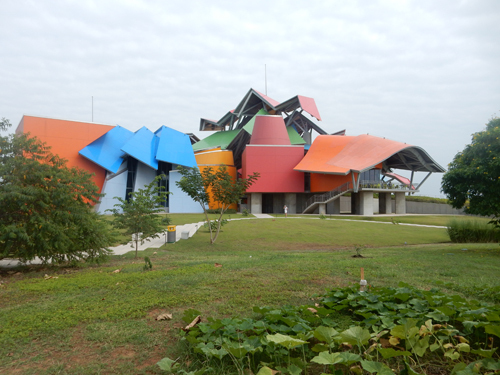 It is surrounded by a “biopark” showcasing Panama’s flora. 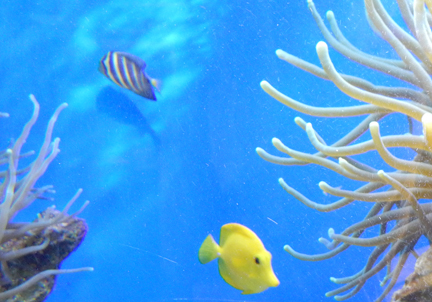 We highly recommend a visit! 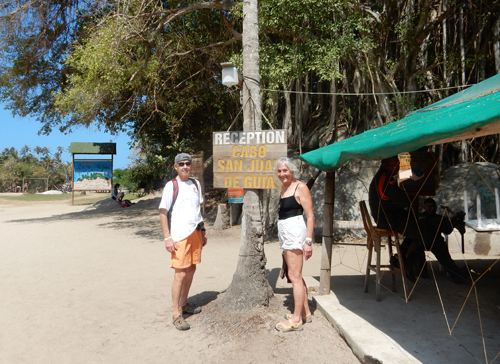 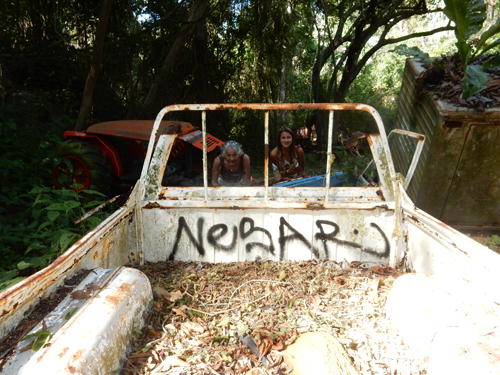 We rented bikes nearby and cycled across the Amador Causeway to the Punta Culebra Nature Center. 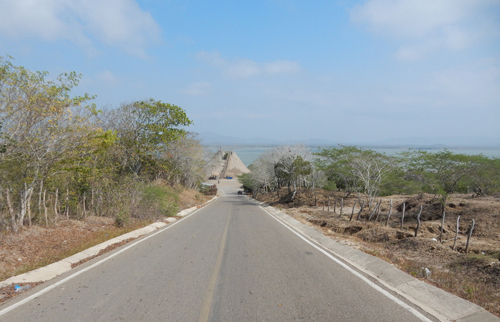 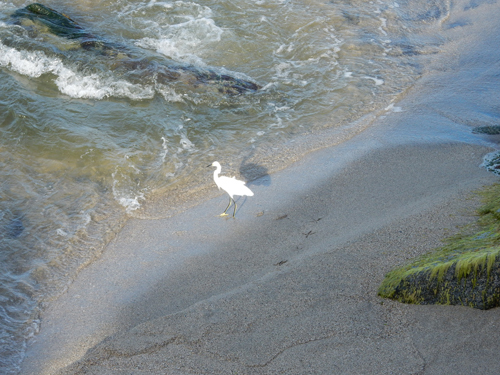 The Causeway extends three miles to the islands of Naos, Culebra, Perico and Flamenco. 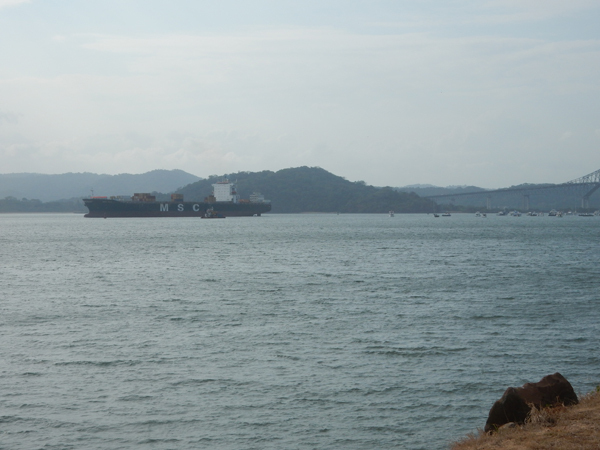 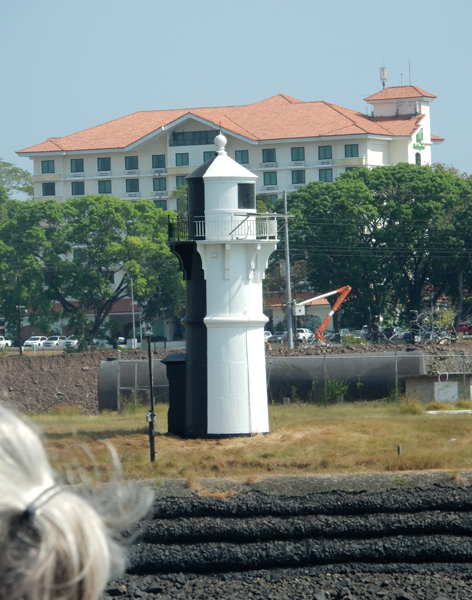 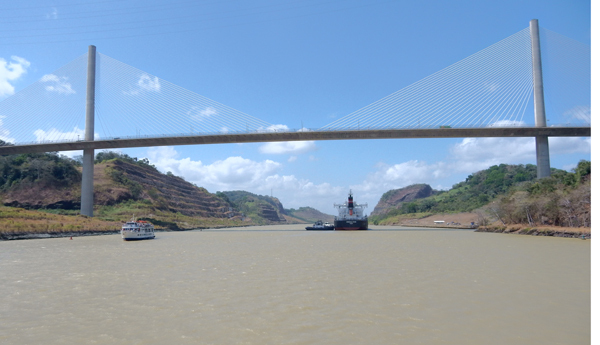 It was built with rock from digging the Panama Canal and protects its Pacific entrance. 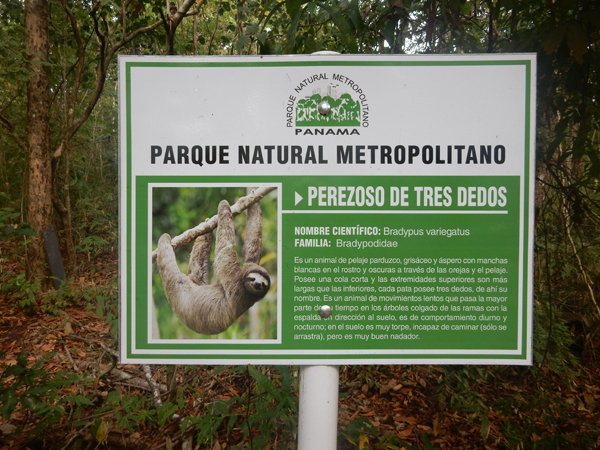 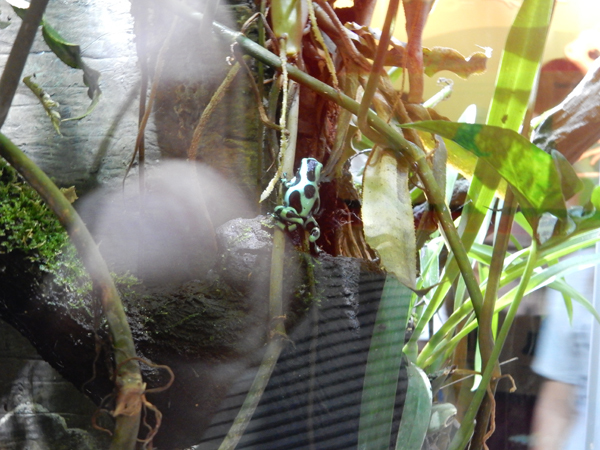 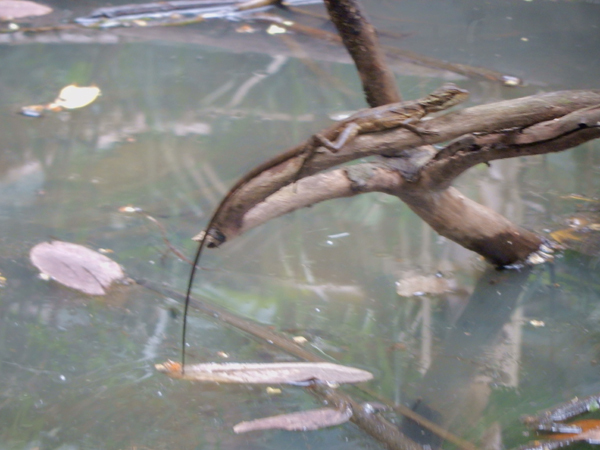 The Nature Center has indoor and outdoor exhibits featuring some of the tropical biodiversity of Panama. 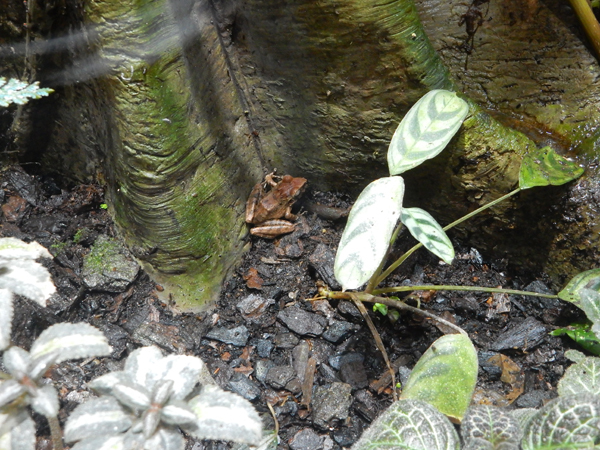 It is run by the Smithsonian Institute. 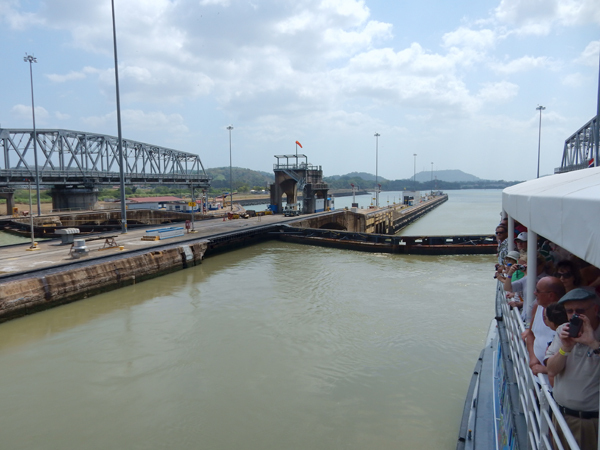 January 29 – I have always had a fascination with ships/boats and have wanted to experience the Panama Canal since I was a young boy. 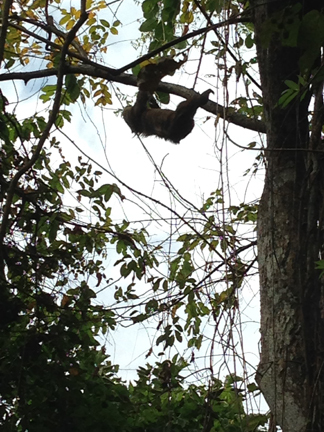 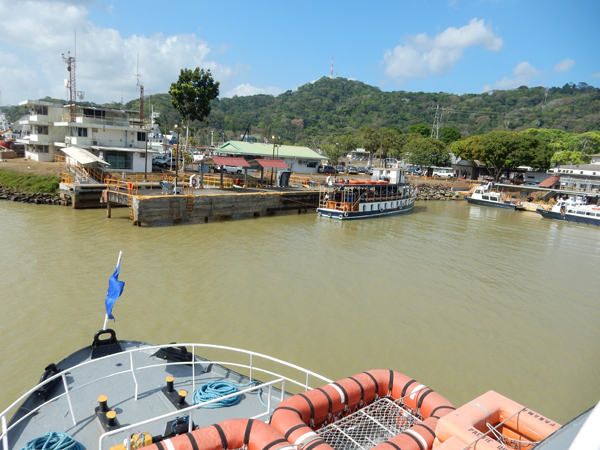 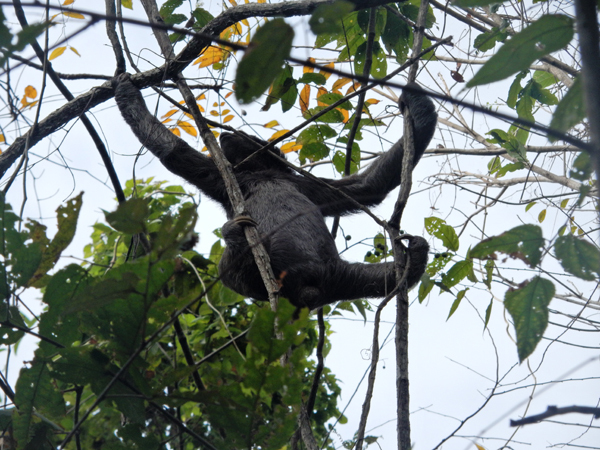 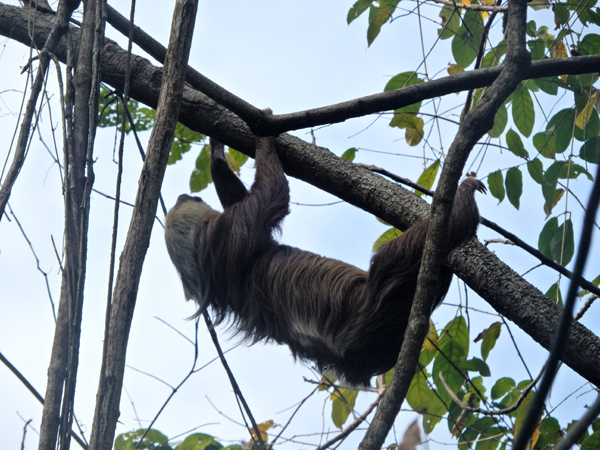 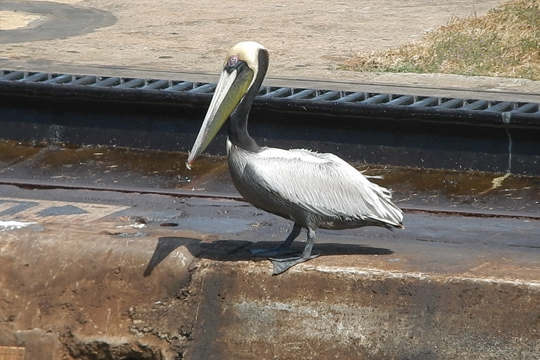 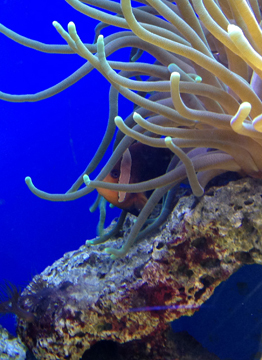 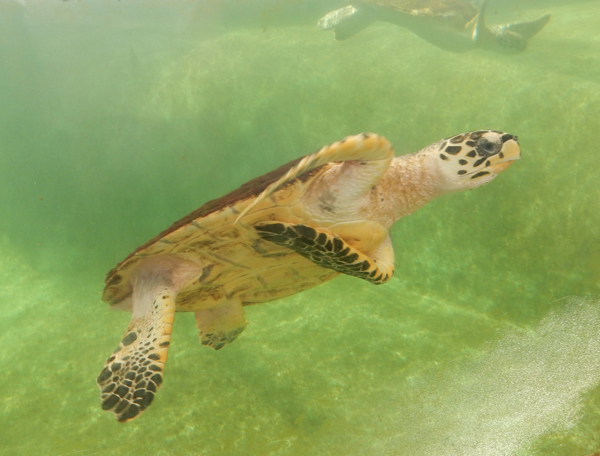 Today was the day – we did a “partial transit” with Panama Marine Adventures on the Pacific Queen. 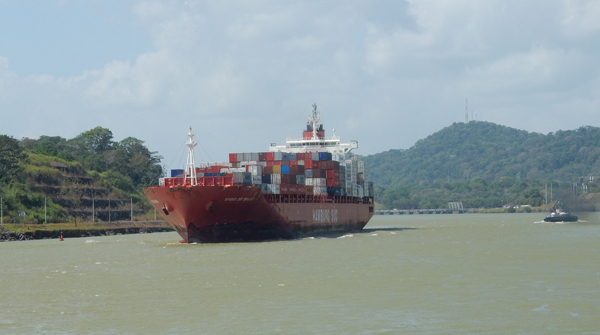 This is a MAERSK line container ship that was actually too large to go through the canal. 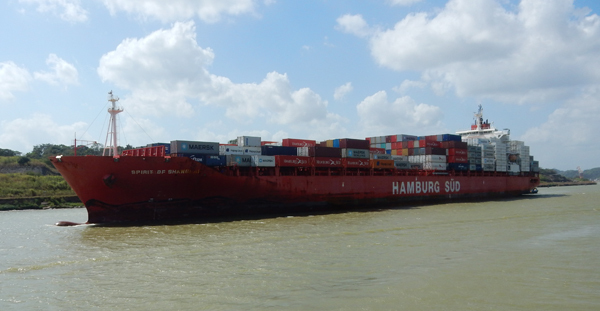 The containers were off-loaded onto a train and taken by rail to the Atlantic side of the canal and re-loaded onto another ship. 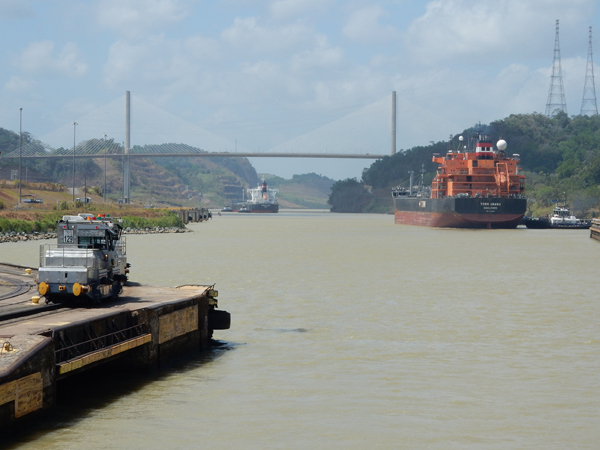 They are building another parallel canal that will accommodate larger ships. 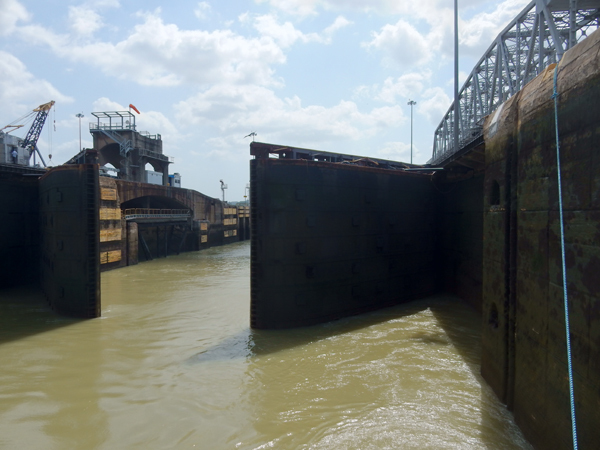 There are three sets of locks on the canal. 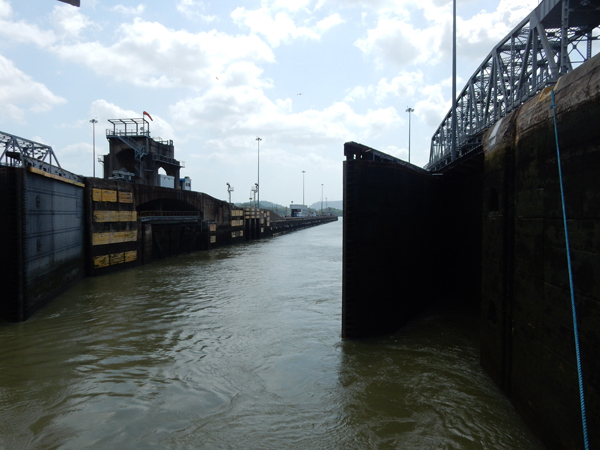 Locks are 110 feet wide and 1,000 feet long. 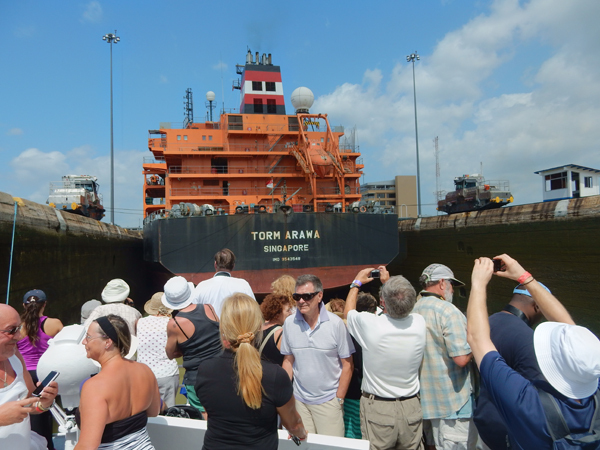 Some ships have been built to fit exactly into the locks. 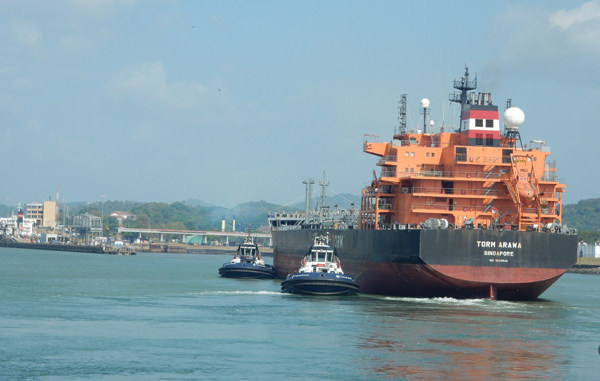 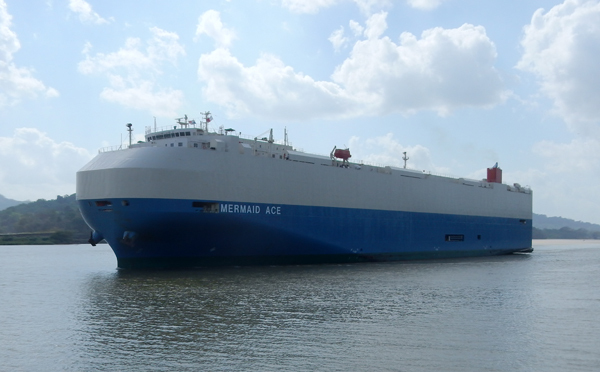 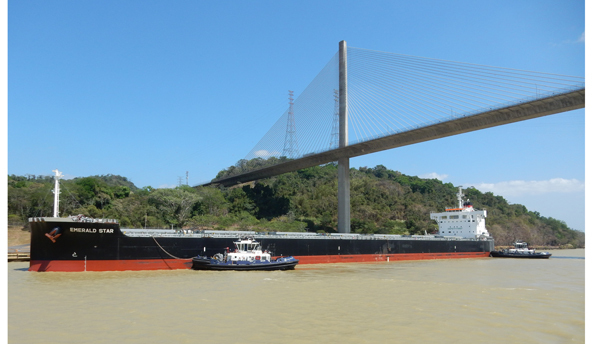 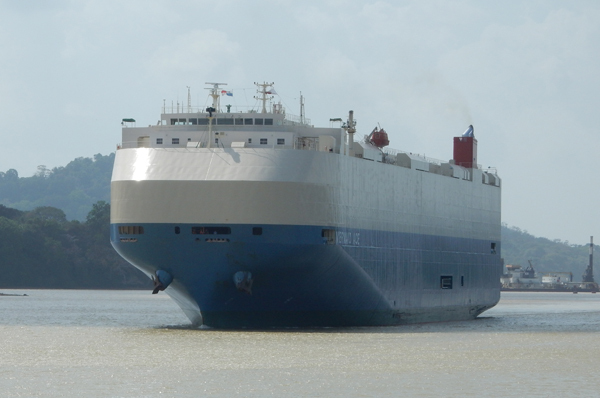 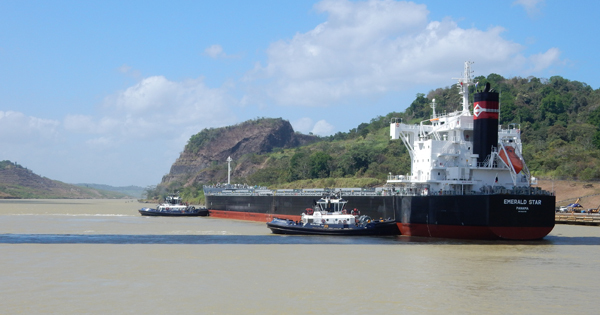 They are called PanaMax and are 106 at the beam and 950 feet long. 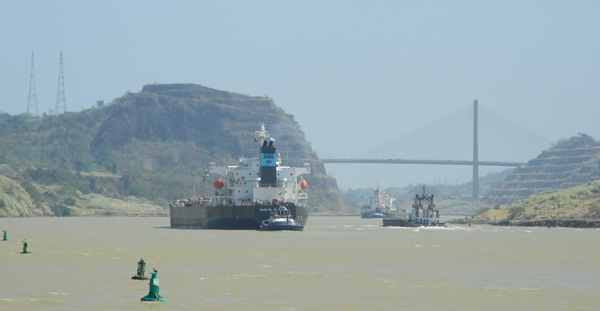 Mule on the left – ships proceeding toward the Atlantic next pass under the Centennial Bridge. 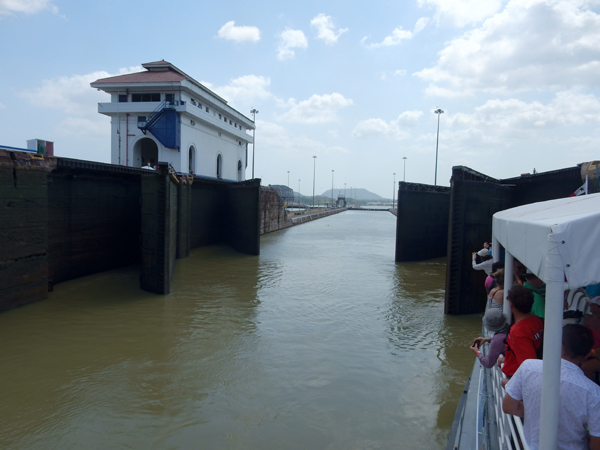 The Canal runs Northwesterly to Southeasterly. 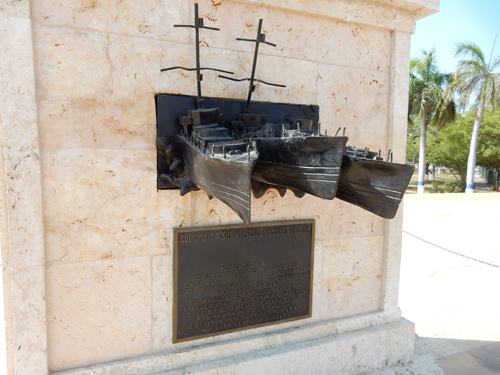 The Atlantic entrance is about 27 miles further west than the Pacific entrance – a good trivia question! 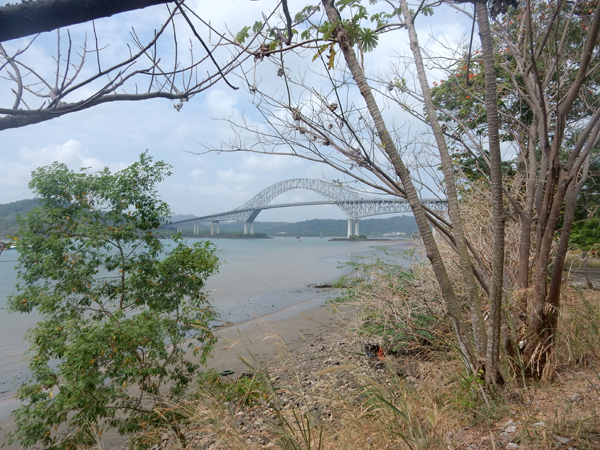 Beyond the bridge is the Culebra or Galliard Cut – through the Continental Divide. 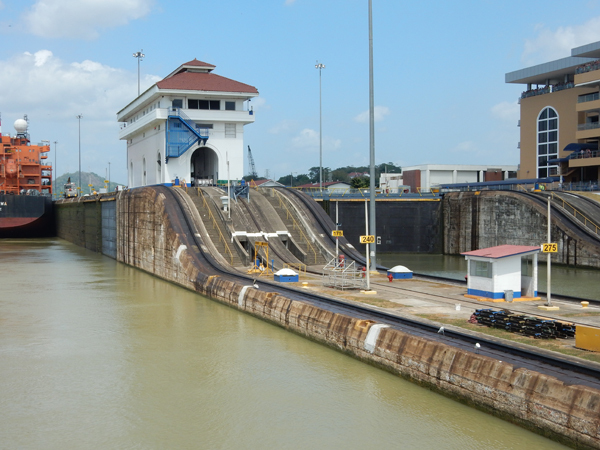 The French spent 20 years trying to build the Panama Canal (1879-1899). 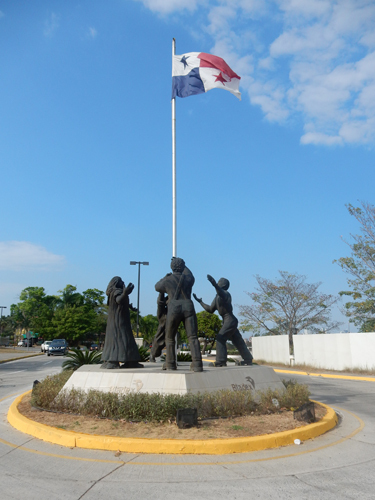 A 1903 treaty allowed the US to purchase rights and properties from the French. 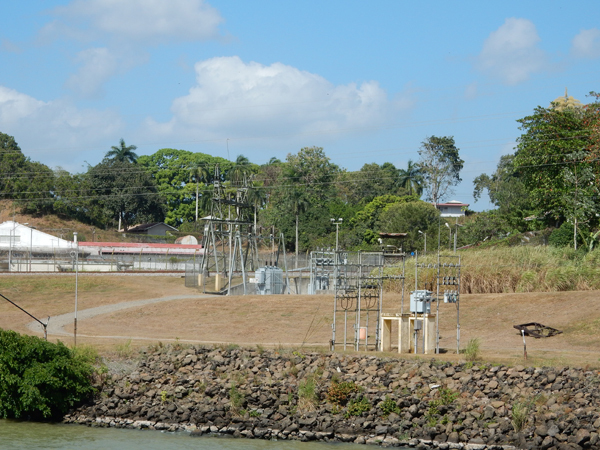 The US also purchased properties from private landholders. 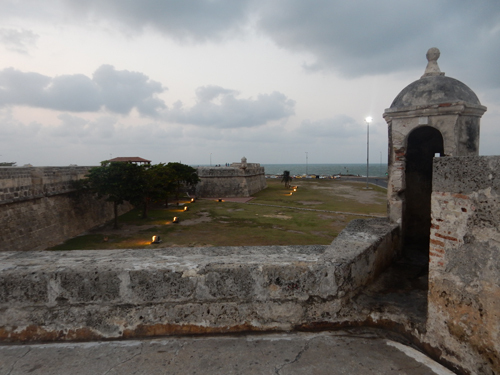 Construction started in 1904 and was completed in 1914 at a total US cost of about 387 million dollars. 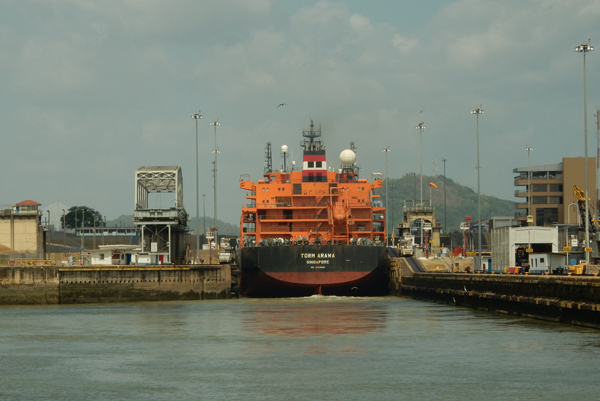 The 1977 Torrijos-Carter Treaties turned the canal over to Panama. 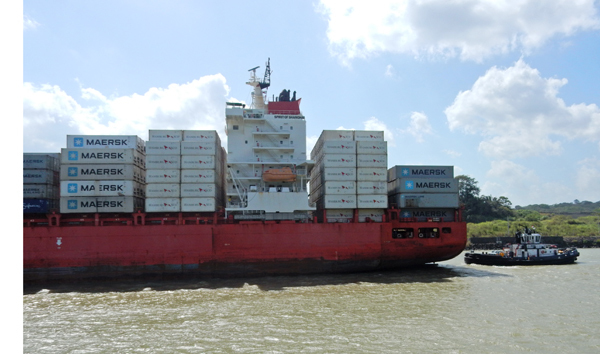 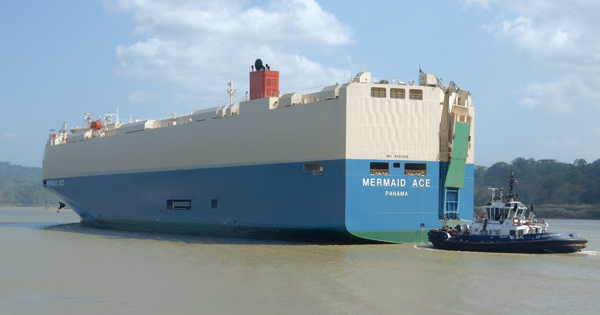 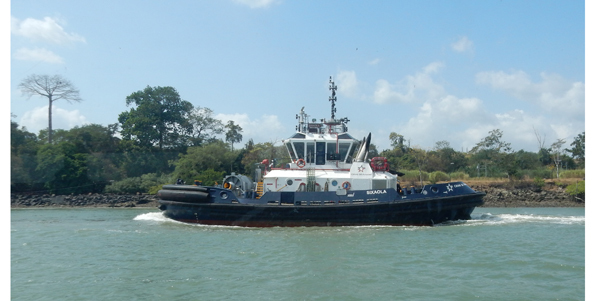 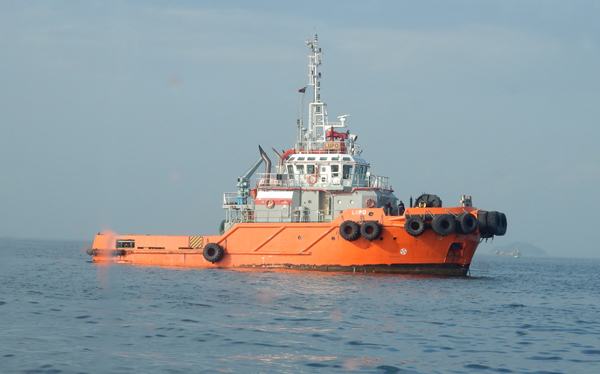 Cost of passage depends on vessel type, size and cargo. 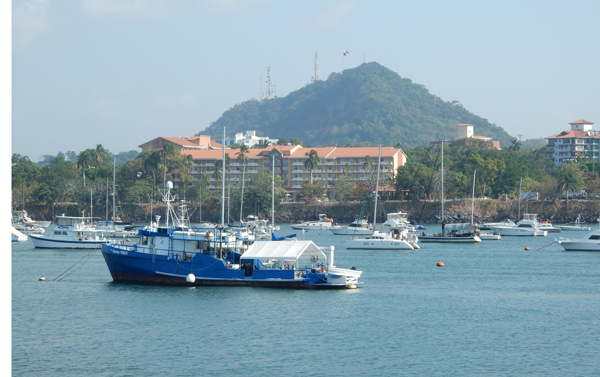 In 2010 a cruise ship paid $375,600. 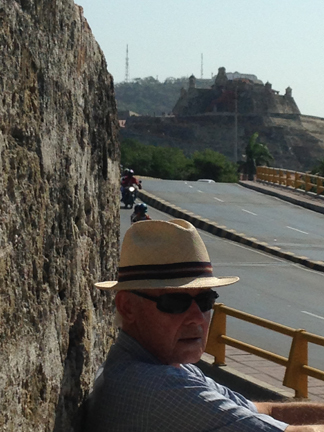 The average toll is $54,000. 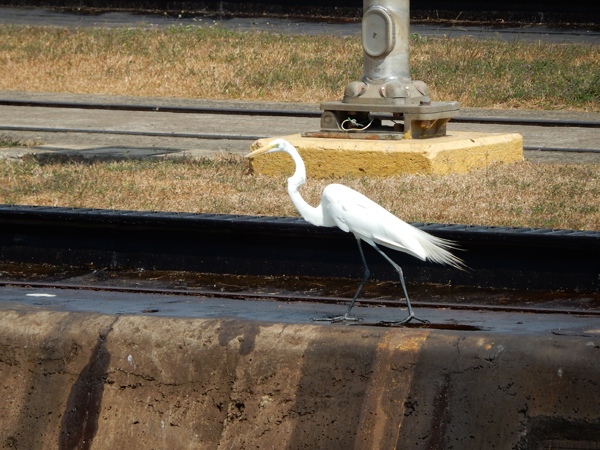 The lowest toll paid was 36 cents by an American who swam the canal in 1928. 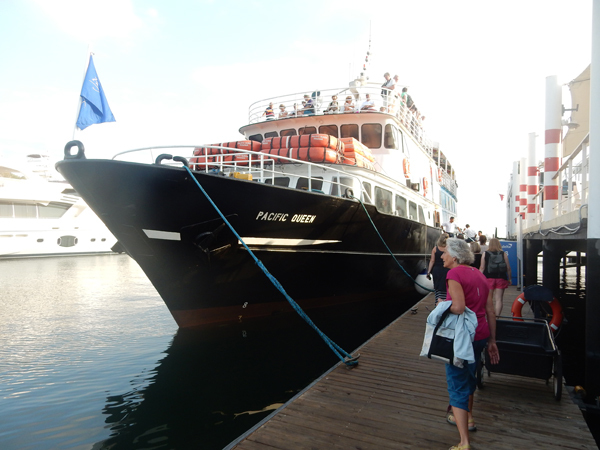 Our cruise ended here and we were taken by bus back to our hotel. 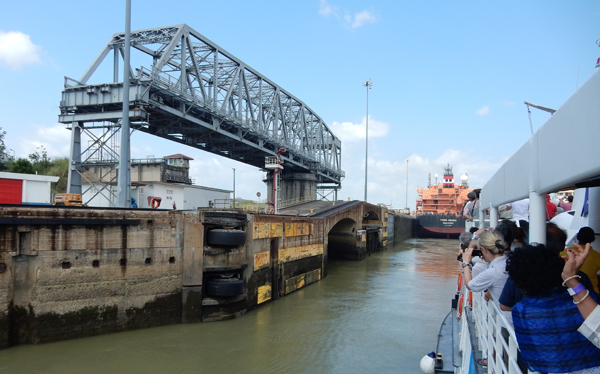 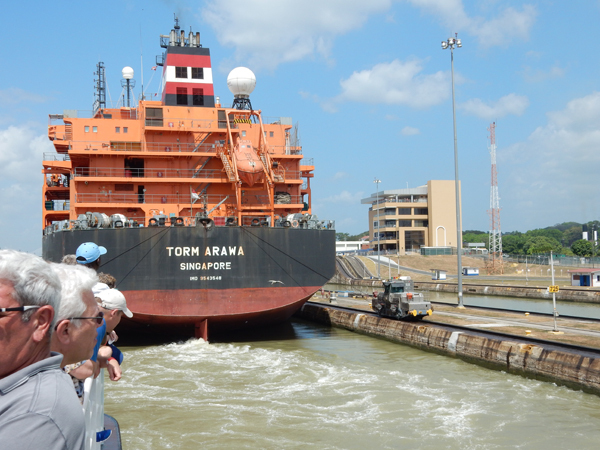 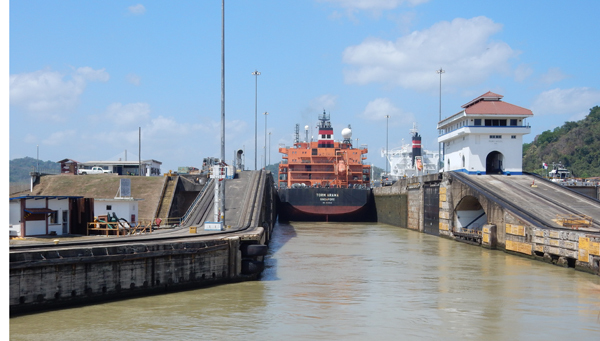 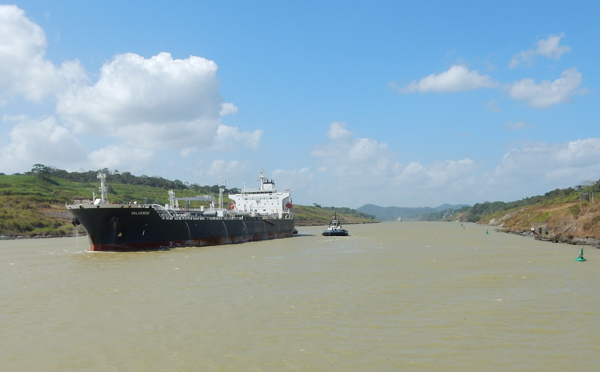 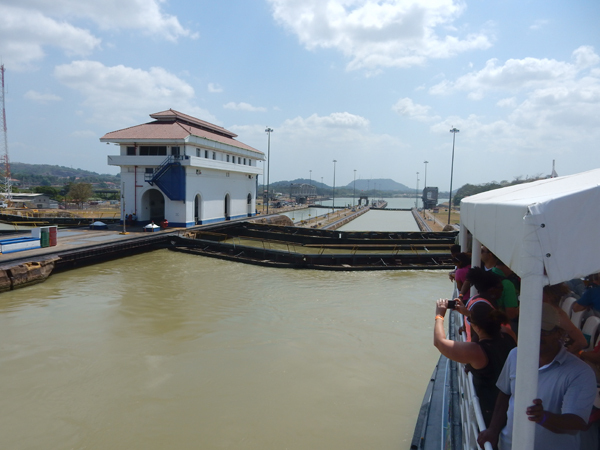 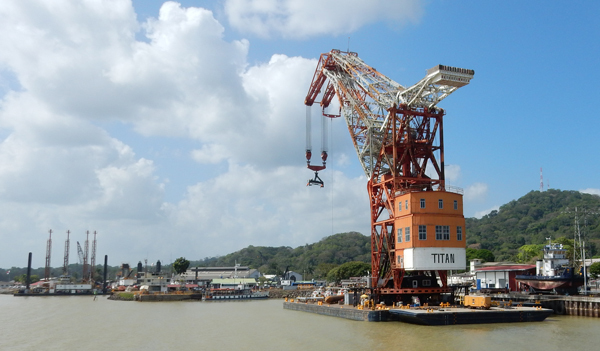 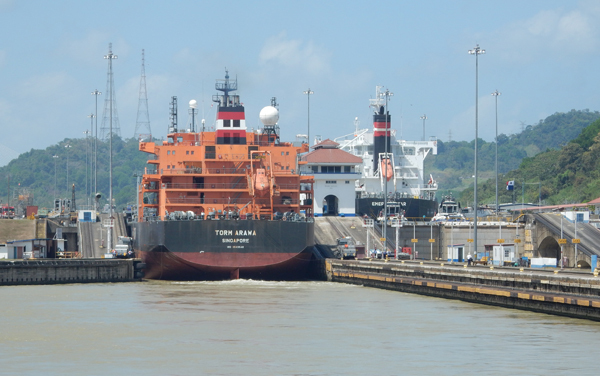 Had we continued through the canal, we would have sailed onto Lake Gatun and then passed through the Gatun locks, which would have dropped us 85 feet to the level of the Atlantic Ocean. 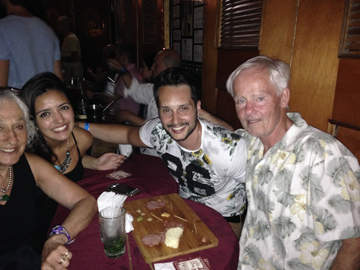 Had dinner at the Balboa Yacht Club on the canal. 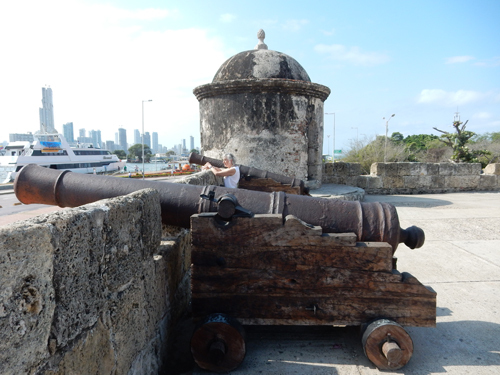 We left the hotel at 5am the next day, flew to Miami and on to San Juan Puerto Rico. 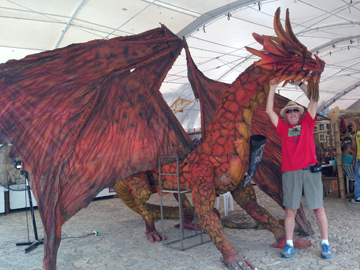 You are currently browsing the The Martin's Blog blog archives for January, 2016.